Annual domain renewal coming up: $150. $65 open after 5 donations. More donations welcome! Fingerprints of Graham Hancock: Giza Plateau no older than 2,580 B.C. "I think it is absolutely fascinating. First of all that Edgar Cayce is drawing attention to a very similar period [10,500 B.C.] and secondly that he is speaking of a Hall of Records and [of] Giza as the legacy of a lost civilization--that somehow the survivors of Atlantis came here and were to do with this. "I actually think [Cayce] is spot on. That's what Giza is all about. This is what I've argued in all my books. And [this is] also what the Egyptians themselves said. That there was a time that they called Zep Tepi, that there was a time of the Gods, [or] mysterious strangers construed as Gods and created the basis, the foundation, of everything Egypt was to become in future ages." Graham Hancock praising Edgar Cayce when interviewed by the Cayce Association. Cayce considered himself to be the Atlantean half-god/half-man "Ra-Ta", who built the Great Pyramid in 10,500 B.C., the same period Hancock is advocating with completely made up arguments. Why the Great Pyramid was built by Khufu around 2,580 B.C. Latin American ruins: not older than 2,700 B.C. "My bet would be that the Ark of the Covenant is an out of place artifact. That it is a piece of technology, a piece of high technology. ... I just mention in passing that gold is an excellent radiation shield. ... The people who could build the pyramids, who could move gigantic blocks of stone that weight hundreds of tons as if they weight no more than a feather, those Egyptians clearly could a lot of things that we can't do today. ... I do argue that they were the masters of a sacred technology. A kind of magic. And that this was manifested in the Ark of the Covenant. ... Well, it is the power of God. ... If you can direct and control divine power in some way..."
Like many people, I've always had a little bit of interest in Egypt and ancient history in general, but never could be bothered to actually study it too in depth. The throdden path is simply too boring to walk. The ideas of various alternative ancient history "scholars" did sound exciting, partly even plausible, but in the end I, like most other people, never knew enough to judge one way or the other. Well, for me, Ayahuasca permanently changed that. After a number of Ayahuasca sessions in mid-2013 in which I was portrayed as a pharoah or priest deeply involved in black magic, with myself and present-day loved ones surrounded by demons, I decided to do a little additional historical research. All of a sudden, mainstream history had become interesting. Could any of the visions have been real? Well, that's something to discuss in another article, but the research soon resulted in ISGP's World History in Timelines: The Basics of Human History Every Person Should Know. Obviously, this oversight includes a specific timeline of Ancient Egypt's entire 3,000 year long pharaoic tradition. All the timelines in the above-linked article are strictly based on mainstream information. Here we are discussing the other side of the spectrum, with one person in particular standing out: Mr. Hancock. Since the publication of his 1995 best-seller Fingerprints of the Gods, retired foreign policy journalist Graham Hancock has become the world's leading alternative expert on ancient history. In this case "alternative" means his belief that an advanced human civilization goes back further than roughly 3,500-3,300 B.C., the point in time that the written script was invented in Sumer, Ancient Egypt and Harappa in modern-day Pakistan. We can be pretty brief about Graham Hancock's theories and arguments. As with virtually all regular Coast to Coast AM guests, he's both wrong and lying with almost anything that he claims. This article is meant to provide anyone with the necessary ammunition in the form of facts and sources to be able to successfully engage Hancock in debate. All his primary arguments are covered and so are many of his secondary. Before delving into Hancock's claims, we start out with a little background information on Ancient Egypt. The Narmer Palette can be seen on the right, depicting the first pharaoh of a united Egypt butchering his enemies. These events took place around 3,150 B.C. Ancient Egypt's pharaoic system has been the world's longest-existing continuous civilization. It began in 3,150 B.C. with the Pharaoh Narmer and ended in 30 B.C. with the death of Cleopatra and the annexation by Rome. A full timeline on Ancient Egypt is included in ISGP's timelines page. A partial timeline on the Old Kingdom, including all the key pyramids, is provided below. Around this time Menes/Narmer, the ruler of Lower Egypt, conquers Upper Egypt and unites the two halves into one country. The Narmer Palette depicts how he decapitated and castrated his enemies in the north after the victory. Menes becomes the first pharaoh. He rules from Abydos and unites the symbols of Lower Egypt, a cobra (the Uraeus), and Upper Egypt, a vulture. They become known as the two ladies and will adorn the crowns of the pharaohs in later dynasties. The Old Kingdom begins, lasting until 2,200 B.C. This encompasses the 3rd to 6th dynasty. The oldest pyramid is finished, the Pyramid of Djoser, after about 20 years of construction. It is stepped and 62 meters (203 feet) high. The Pyramid of Meidum seems to have collapsed around this time due to an angle that is too steep. Construction is stopped at 65 meters (213 feet) high. It appears that it was originally built for Pharaoh Huni, but Pharaoh Sneferu took over construction. Sneferu invades neighboring regions to capture land, resources, cattle and thousands of slaves. The Bent Pyramid is finished around this time. The original angle appears to have been too steep, which was abruptly changed to a less steep one, possibly after the collapse of the Pyramid of Meidum. It 101 meters (331 feet) high. The reign of Pharaoh Sneferu ends. He has also built the Red Pyramid, thought to be the first successful smooth-sided pyramid. It is 105 meters (344 feet) high and constructed from solid granite. There's some evidence that it was built over a relatively small, water-weathered structure. The Great Pyramid at Giza, or the Pyramid of Khufu/Cheops, is finished after about 20 years of construction. It is 146 meters (479 feet) high. The Pyramid of Khafre is finished, located next to the Great Pyramid. It is 136 meters (446 feet) high. The evidence seems to point out that the construction of the Great Sphinx began soon after the completion of the Pyramid of Khafre. The Pyramid of Menkaure is finished around this time. At 66 meters (216 ft), it is the smallest of the three main pyramids at Giza. Finishing up of the Pyramid of Neferirkare. It is 72 meters (236 feet), stepped, and constructed from relatively small stones. A massive worldwide drought. Reportedly rain decreased even more to what it is today, forcing Egyptians to be completely dependent on the Nile. This period coincides with the end of the Old Kingdom. All major pyramids were built during the Old Kingdom, when the power of the pharaohs was at its maximum. Even though Egypt has about 90 pyramids in total, the Pyramid of Neferirkare is the last one really worth mentioning, and even then only barely. Because of its relatively small stones it has weathered quite a bit more than some of the earlier built pyramids. It is also of a simpler, stepped design. General knowledge of history. We have an enormous amount of archeological information from around the world, combined with modern techniques as carbon dating and genetic research . The first great civilizations, coinciding with the first forms of writing, arose in 3,500 B.C. in Sumer (Iraq), immediately followed by Harappa in the Indus Valley of Pakistan and along the Nile in Egypt. Before this time primitive people lived in small farming and hunting communities. There was a basic understanding of astronomy and on occasion small megalithic structures were built, but this is as far as scientific achievements went. As for knowledge specifically related to Egypt: It took 50 years of trial-and-error to built the first successful pyramid. The first pyramid is the 62 meter (203 feet) stepped Pyramid of Djoser, roughly around 2,610 B.C. The next, the Pyramid of Meidum, collapses at 65 meters (210 feet) around 2,600 B.C. In the same period the Bent Pyramid is suddenly corrected halfway through with a less steep angle. It ends up being 101 meters (330 feet) high. The next pyramid is the solid granite 105 meters (345 feet) high Red Pyramid, finished around 2,590 B.C. This is the first successful smooth-sided pyramid. Construction will soon begin on the Great Pyramid. In 1837 English explorer Colonel Howard Vyse and associates as Samuel Birch discovered workmen's writings in red paint inside a number of completely sealed rooms, built to relieve pressure on the King's Chamber in case of earthquakes. These writings contain the names of workers and several pharaohs. One part reads "the followers, gang, of Khufu" and another "Khnum-Khuf". Even though it may seem a little silly, it would help to try and carbon date the red paint, simply because prominent con men as Zecharia Sitchin have been putting a lot of effort in seeding doubt about the motives of Vyse. To make matters worse, Sitchin's ideas greatly influenced the 1994 movie Stargate , which was subsequently followed by 17 seasons of related miniseries. The main actor and scientist in the 1994 movie, Dr. Daniel Jackson, can be heard saying that Vyse's "discovery is a fraud," along with other typical Sitchin (and later Hancock) claims. The ironic thing is, even if Vyse somehow manipulated the graffiti, it wouldn't alter the final conclusion that the Great Pyramid dates back to 2,600 B.C. The four shafts of the Great Pyramid stood oriented towards Orion, Sirius, Alpha Draconis, and Kochab - not today or 10,500 B.C., but in the 26th century B.C., at the exact time the Giza plateau was built. Orion pretty much was the Mount Olympus of Ancient Egypt. Here the Pharaoh would travel to in a boat after his death, with help from Duat (underworld) ruler, Osiris. At the same time Orion itself was equated with Osiris, with the pharaoh's purpose being to become one with Osiris and Orion. The nearby star Sirius was associated with the goddess Isis. As for the two northern shafts, these pointed towards Alpha Draconis, the pole star at the time (now Polaris); and Kochab, another bright star used for navigational purposes. A general knowledge of world and Ancient Egyptian history indicating that the pyramids would have had to be built after the invention of the Egyptian written script in 3,400 B.C. and the unification of Egypt under the first pharaoh, King Narmer/Menes, in 3,150 B.C. Herodotus, the Inventory Stela and the graffiti all pointing to Khufu, who died in 2,566 B.C., as the builder of the Great Pyramid. The four shafts indicating a period of roughly 2,550-2,600 B.C. that the Great Pyramid was finished. Three carbon dating projects, eventually giving us a date of roughly 2,580 B.C. The Great Pyramid was built from roughly 2,580 to 2,560 B.C., the order coming from Pharaoh Khufu. The stepped Pyramid of Djoser at Saqqara with cobra symbols in the foreground. Hancock claims that the Great Pyramid was built using anti-gravity technology linked to Atlantis and the Ark of the Covenant. Just one problem is: Atlantis never existed, because the story told by the Egyptians to the Greeks about this lost continent is a total impossibility. There's no evidence that the Ark has ever existed either. How the stones were moved is addressed further down. Hancock claims that human civilization is cyclical, with Ancient Egypt and Babylon being remnants of older, lost and possibly more achieved civilizations. Partly to counter this argument, ISGP has created detailed timelines of world history, as this is the only way for people to quickly get a grasp of history and understand that these days there are no mysterious gaps in Early Modern Human (EMH) history where these lost societies could potentially be found. Hancock still promotes the Earth's Crust Displacement/Pole Shift Theory , developed by Manuel Velikovsky in 1950 and promoted further by Dr. Charles Hapgood in 1958. The thing is, in the early to mid-1950s scientists were still absolutely puzzled by emerging evidence of continental drift: continents continually drifting apart. A variety of theories were introduced, among them Earth's Crust Displacement. However, in 1958 the now thoroughly verified (and rival) plate tectonics theory was introduced and scientists have never looked back since. We also know that never in the last billion years or so has there been a rapid and catastrophic pole shift. There have only been various degrees of polar wander, always taking place over millions of years. The only reason Hancock and other alternative authors continue to promote Earth's Crust Displacement Theory is that only such an allegedly catastrophic event of shifting poles and land masses could possibly explain the disappearance of an entire advanced civilization. And let's certainly not forget here that this same Hapgood was as fringe an individual as they come. More on him later on. Hancock claims that knowledge of astronomy is evidence of a lost civilization. It's not. Astronomy is older than the first great civilizations, as evidenced by the German Goseck Circle of 4,900 B.C. and Nabta Playa in Egypt in 4,500 B.C. Keeping an eye on the sun and the stars was important for primitive people in order to know when to sow, when the floods could be expected, when to harvest, or when and where certain herds of animals could be found. In addition, the pole stars have always been important for navigational purposes, with the Ancient Egyptians using it to align the pyramids to true north. Hancock ignores the fact that the pyramid's shafts only align with key stars during Egypt's Old Kingdom in the period around 2,600 B.C. Hancock has been aware of this since his 1995 book Fingerprints of the Gods , but, like the Cayce Association , continues to argue for a 10,500 B.C. "origin" of the Great Pyramid and Giza Plateau. It appears that Hancock prefers to rush over this fact, instead preferring to focus attention on some of the bogus issues starting with number 9 here that for his ideas are much more convenient. Hancock and Bauval have claimed that the three pyramids at Giza formed an exact representation of the three stars of Orion Belt's, not so much in 2,500 B.C., but rather in 10,500 B.C. The highly-esteemed astronomer Anthony Patrick Fairall (1943-2008), who ran the Cape Town Planetarium, and a colleague, redid Bauval's calculations and found that they were wrong. There's no exact match at all with 10,500 B.C. and neither is there with 2,500 B.C. Personally, I still would not be surprised if the three Giza Pyramids were roughly meant to be a representation of Orion, as the two pharaohs after Khufu appear to have had lower standards of precision in construction than Khufu. But it is impossible to prove, something that Hancock and Bauval appear to know all too well. For 3,800 years the outer surface of the Giza pyramids consisted of polished limestone. Only in 1,300 A.D. a massive earthquake loosened much of the outer casing, which was soon thereafter used in the construction of other buildings. The pyramids we see today have only been exposed to the elements for 700 years. The Sphinx's face has been exposed to the elements for 3,800 additional years compared to the pyramids as we see them today. Luckily it consists of a relatively hard limestone and therefore is still relatively well preserved. However, most of the Sphinx's body consists of a much lower quality limestone than either the Sphinx's face, its bottom layer, or the pyramid blocks. This is why most of the uncovered body of the Sphinx shows heavy weathering by rainwater; it doesn't take much for this to happen. Remember: the Sphinx was carved as a whole from the bedrock and sits in a hole in the ground. It does not consist of high quality limestone blocks specifically mined for the purpose of construction. There may have been more rainfall than today during the Old Kingdom, until the drought of 2,200 B.C. But this theory is really moot at this point. Hancock claims the Giza plateau was picked by the Ancient Egyptians, because in 10,500 B.C. the path of the Nile River at this location exactly mirrored the Milky Way. 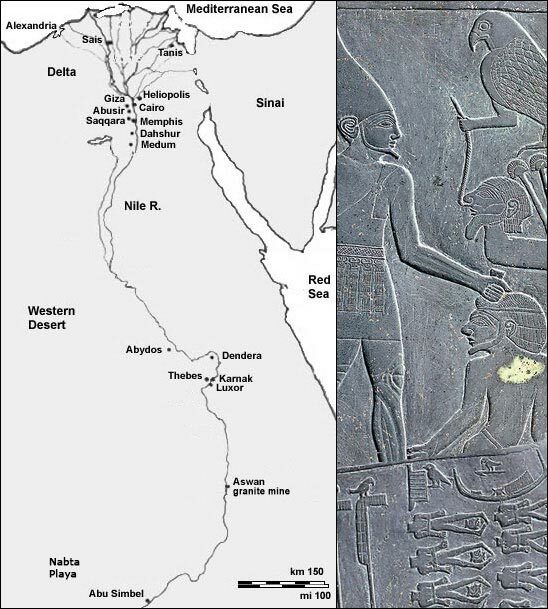 Dr. Fairall argued that it would be impossible to know the exact path of the Nile River in 10,500 B.C. It must be said, Hancock never mentions any geological surveys investigating the historical path of the Nile. What we do know, and so does Hancock , is that Egypt used to be a Savannah with much more rainfall. Erosion, climate change, and major floods all could have permanently altered sections of the Nile's course. We would need more data before even remotely entertaining this argument. It is a rather "out there" theory that doesn't fit the known historical timeline at all. Hancock claims the Great Pyramid incorporates pi. This is true actually , but was already reported by John Taylor in the 1830s , with many Egyptologists wondering how deliberate this incorporation of pi has been. Taylor also accurately stated that the Great Pyramid made use of the Golden Ratio , something surprisingly not mentioned in Hancock's 1995 Fingerprints of the Gods. It's hard to say for certain to what extent these mathematic principles were incorporated on purpose. For example, 2pi and the Golden Ratio are tightly linked , in a similar manner that the Fibonacci Sequence is tied to the Golden Ratio  - you can't have one without the other. Also, the other pyramids make little to no use of pi or the Golden Ratio , nor do we have any texts from this period documenting these concepts. So we just don't know. One thing is certain though: even if the Ancient Egyptians already had knowledge of pi and the Golden Ratio, it changes little about human history. It might be intriguing math for a variety of reasons, but it is at the high school level. That sounds really impressive, especially when you say it quickly, but all pyramids with a slope angle of 51.5° are automatically based on pi and have similar dimensions as a sphere--a sphere like... the earth. The Great Pyramid has an angle like this, but happens to be among the exceptions. All Ancient Egyptian pyramids have varying slope angles. Who knows, pi could have been included on purpose or by accident, even though it serves little purpose in a square design, but in any case the Ancient Egyptians had no knowledge whatsoever about the dimensions of the earth. To explain this a bit more: 3,950 miles (pole to center of the earth) x 2 = 7,900 miles (diameter from pole to pole). Multiply this with pi and we get a circumference 24,819 miles. Our calculation here differs only 0.16% from the official "meridional circumference" (over the poles) of 24,860 miles, which is only 0.17% different from the equatorial circumference of 24,902 miles. Why? The earth is a ball, but not entirely 100 percent perfectly round. If the Great Pyramid perimeter-to-height ratio is based on pi, then of course there's going to be a correlation with equatorial circumference and the "height" of the earth as measured from the equator: they need to be in balance. The fact that the Great Pyramid has a square design, makes it harder to see, but there's no mystery here. Just imagine the world with the Great Pyramid sunken into the earth, resting at the center with center of its base. Scale the Pyramid just right, in this case by enlarging it 43,200 times in all directions. How much it needs to be scaled depends on the size of the sphere, but the dimension always remain in balance. With 43,200 the tip of the pyramid will touch the north pole of the earth. Why? Because both are based on pi/balanced circles. In case of the earth, a sphere, this is natural. Now imagine the Great Pyramid's sides morph into a round sphere while keeping the exact same circumference. The base of the pyramid will fit perfectly all along the meridian line of the earth. Hancock and others often point out that it would have been impossible to build the Great Pyramid in the traditional sense, because it consists of 2 million blocks with an average weight of 2.5 tons. 10 blocks an hour would have had to be put in place every hour over a 30 year period to accomplish this feat. Although this sounds incredible, the base of the pyramid, where by far the most blocks can be found, is 215 by 215 meters (706 by 706 ft). This allows dozens of crews to work simultaneously, with a crew of 20 men necessary to pull up one 2.5 ton block on a sled. In a detailed 1999 study Civil Engineering estimated that even between levels 50 to 74, roughly 180 blocks would have been put in place every hour. Whatever the exact truth, clearly 10 blocks an hour would not have been a problem. Hancock and others often point out that the much heavier granite blocks from Aswan (most blocks are limestone, which were mined close by, at Tura), one being 80 tons, would have been impossible to transport. This is nonsense, considering primitive people from all over the world were moving stones of tens, even hundreds, of tons. The Lateran Obelisk, its largest piece over 300 tons, was moved from Karnak in Central Egypt all the way to Rome. The fallen granite statue of Ramesseum at Thebes weighs over 1,000 tons and has been transported 270 kilometers / 170 miles in one piece from Aswan. Compared to these weights, the pyramid stones were child's play, even the largest ones. Image from the tomb of Djehutihotep, depicting roughly 120 Ancient Egyptians on four ropes pulling along a giant statue by means of a sled and ropes. Water is poured in front of the sled to reduce friction. Let's make an estimate here for the 80 ton stone. In contrast to the Romans, the Ancient Egyptians did not have access to horses, oxes, or elephants. Long-distance stones were moved over the Nile. Short distance they had to be pulled on sleds. Water was poured in front of the sleds to reduce friction by roughly another 50 percent. If we assume that one person can pull 50 kilograms / 110 lbs on a sled over any significant amount of distance and then onto a slope, the Ancient Egyptians would have needed 1,600 people to move this one stone. Eight thick ropes with 200 people pulling in unison on each rope: it requires some coordination, but it is do-able, especially when it only involves a very limited amount of stones with this weight. Considering stone pullers would be getting stronger in a short period of time due to hypertrophy and the fact that Civil Engineering estimated that 1 worker could pull at least 125 kg (275 lbs), and quite possibly we'd be looking at less than 650 people who could move that stone. Left: small bow drill in Ancient Egypt. Mid and right: drilling into granite with a copper saw combined with quartz sand. It appears the Egyptians managed to put over a ton of pressure on their drills when working with granite. Hancock and his allies claim that it would have been next to impossible for the Ancient Egyptians to drill into or cut granite, because the hardest metal available at the time was copper. It's true that copper, as well as bronze, can't be used by itself to shape granite, although it does work on limestone. However, as Hancock was already aware of , add (quartz) sand to a copper saw or drill and all of a sudden it's not a problem to cut granite and drill cylindrical holes in it. It's also possible to chip away granite with other granite pieces, or with the even denser and more pressure resistant diorite / dolerite , a type of stone that was shaped into hammers and other tools by the Ancient Egyptians. The next question Hancock asks is how the Ancient Egyptians were able to carve hieroglyphics in diorite / dolerite. It's easy to ask questions and not look for answers, as Hancock is fond of doing. Little (published) investigative work appears to have been done on the carving of these stones, but it is generally understood that diorite / dolerite was ideal for fine print due to its hardness. Maybe the simple answer to working these stones is quartz, other pieces of diorite / dolerite, and a little additional patience. In any case, there's no need for the theory that advanced alien power tools were used. Conclusion: Hancock ignores and spins all evidence pointing to a 2,600 B.C. origin of the Great Pyramid and prefers to focus on bogus theories that are supposed to point to a 10,500 B.C. origin of the whole Giza plateau and even surrounding structures. Graham Hancock's obsession with 10,500 B.C. and a lost sunken civilization (Atlantis) is not hard to understand either. He is doing his best to back up the claims of the "sleeping prophet", Edgar Cayce, whose legacy is continued today through Cayce Association, David Wilcock and Coast to Coast AM, all of which Hancock is closely affiliated with. There's increasing evidence that major asteroid / meteorite impacts happen a lot more frequently than previously thought--which Hancock is obviously going to focus on--but nothing that could permanently wipe out all evidence of a major "lost" civilization. Still, emerging evidence on the Burckle Crater, the Gulf of Carpentaria, the Mahuika crater, Campo del Cielo, Rio Cuarto, and the Ice Age impact over North America are pretty worrying. See ISGP's timeline on "Important asteroid impacts, volcanic eruptions and tsunamis within human time span" for details. Since the early 1990s Hancock's principal colleagues and supporters have been John Anthony West, Robert Bauval, and Robert Schoch. Virtually no mainstream archeologists or other scientists back these people. The vast majority of support comes from fringe authors who revolve around Coast to Coast AM. In 2001 West's produced his documentary serie Magical Egypt, with its extreme focus on the idea that the Egyptians were wise, spiritual people in the possession of hidden esoteric knowledge. Tarot cards continually flash by over the screen with a lot of time being spent detailing Schwaller de Lubicz's questionable Synarchist-type research on the "Temple of Man", i.e., the Temple of Karnak in Luxor. The fact is, when the Old Kingdom pyramids were built in the 26th century B.C., the power of the pharaoh was at its maximum. Khufu was the god Horus, son of Osiris, and a god-king with absolute power. Old Kingdom Egypt was the most absolute form of a pharaoic theocracy. There's little evidence of any type of spirituality or growing knowledge about kundalini and/or meridian system, as began to develop in the Far East. The Egyptian concept of a human soul and its five components does little to change that. Knowledge hardly exceeded the superstition level. In Magical Egypt, in part based on inaccurate information of Bauval and Hancock and in part because it "corresponds to the [Gods legends in the] Egyptian texts themselves", West states his belief that the Sphinx is 38,000 years old. That's just 12,000 years after the creation of Early Modern Human (Cro-Magnon) and 2,000 years after the first signs of tool-making in Egypt, not to mention more than 30,000 years before the development of the first written script. This is like claiming that dinosaurs never existed because the bible didn't mention them. ISGP also has a timeline on dinosaurs, by the way, for those in doubt. In Magical Egypt, West makes it clear that he first heard about water erosion patterns on the Sphinx in one of Schwaller de Lubicz's books. In the late 1980s West hired the freshly-graduated Yale geologist Robert Schoch to investigate the erosion marks. While Schoch concluded that the Sphinx was probably no older than 7,000 B.C., West continued his belief that the monument dates back to a whopping 36,000 B.C. In Magical Egypt West completely forgets to discuss the fact that most of the Sphinx's body consists of very poor quality limestone that easily erodes, certainly the exposed aspects. In contrast to the pyramids, consisting of carefully selected limestone and granite, and shielded from the outside world until the 14th century, the Sphinx was carved from the bedrock. This aspect has already been discussed. In Magical Egypt, West demonstrates a number of deorite, granite and porforie vases and statues he claims could not have been made by the Egyptians themselves because they had nothing better than copper tools. This aspect has also already been discussed. While it has been demonstrated that granite can easily be worked with copper drills and saws in combination with quartz sand, we certainly need a number of experiments as to how exactly diorite was carved. However, this doesn't take away that numerous statues, texts and even hammers were created, all made and perfectly shaped from diorite. There's no need to claim that simple, primitive vases were created with the aid of exotic technology. The hieroglyphics are rather easy to explain. They were formed when one set of hieroglyphics was overwritten with a second set around 1,200 B.C. The following three photos should make this clear. The first photo depicts the apparent vehicles. The second picture is from the Temple of Karnak, where a copy of the original set of hieroglyphics can be found. The third picture identifies the two different sets of hieroglyphics. This aspect has already been discussed earlier in relation to the Great Pyramid. Hancock and other people in the alternative field all claim that the Baalbek stones couldn't have been moved by human effort. Often modern cranes are mentioned, most of which have the biggest trouble lifting and moving 800 tons or more. This comparison is skewed, however. These 800 ton blocks didn't have to be lifted off the ground. They were pushed and pulled in place, which is many times easier to do. Primitive people from all over the world were moving stones of tens, even hundreds, of tons. The Lateran Obelisk, its largest piece over 300 tons, was moved from Karnak in Central Egypt all the way to Rome. The fallen granite statue of Ramesseum at Thebes weighs over 1,000 tons and has been transported 270 kilometers / 170 miles in one piece from Aswan. I personally know I can push a 1,350 kilograms (1.35 tons; 3,000 lbs) car down the road without that much trouble, which is about 10 times more than the average male can lift off the ground under ideal circumstances. Highly trained strongmen using a harness and a second rope to pull have moved fire trucks weighing up to 36,000 kilograms (36 tons; 80,000 lbs). In some cases two large draft horses can move an 8,100 kilograms (8 tons; 18,000 pound) sled located on loose dirt ground. Making the ground in front of the sled wet will reduce friction with a considerable percentage. If the weight is loaded onto a wagon, most horse pairs will pull double that weight. Looking at these numbers, an 800 ton block on a wagon, or located on something that reduces friction to a similar extent, can be pulled by roughly 100 horses or 600 men. The friction to move these stones could have been reduced by the use of wooden or stone rollers, pointy stones, gravel, or rafts and boats floating on water. Small ramps could have been created to pull the stones on top of a wall. It's a project of considerable magnitude, especially in the hundreds of tons range, but humans could definitely have moved stones of this weight. There's no need to suggest anti-gravity devices or aliens, as Hancock and his allies have been doing. Bimini Road was a "discovery" of Cayce cultists in 1968 and has been investigated by at least three established scientists who all determined it to be a form of tessellated beachrock. In addition, one of them, Eugene Shinn of the U.S. Geological Society, carbon dated fossils found in the rocks of Bimini Road to roughly 3,000 B.C. While all of this was figured out in the 1970s, even today Bimini Road continues to be promoted as a remnant of Atlantis by the Cayce Association and guests of Coast to Coast AM. Hancock, of course, also hasn't made up his mind about the Bimini structure, still toying with the idea that it is an ancient remnant of an Atlantis-type civilization.. This issue is discussed in a separate article, along with the Cuban Atlantis. The Japanese underwater formation was brought to the attention of the world after dives of Graham Hancock, John Anthony West and Robert Schoch, financed by Japanese businessman Yasuo Watanabe--a fan of Graham Hancock. West and (geologist) Robert Schoch concluded that the formation was natural while Hancock holds on to the idea that it is probably man made. As for Japanese history, DNA and archeological research demonstrate that Early Modern Humans (EMH/Cro Magnon) migrated to Japan around 14,500 B.C., when the country was still attached to the Asian mainland. This was around the same time that Early Modern Humans crossed the frozen Bering Strait into North America. The hunter-gathering Jomon culture existed from roughly 14,500 B.C. to 300 B.C. By 200 A.D. Japan was ran by Himiko, a shaman queen who controlled an alliance of tribes. Yonaguni is located close to 30 meters (100 feet) below sea level, indicating that it disappeared underwater roughly 7,000 B.C. This is a clear indication that only primitive people of the Jomon culture could have been involved in shaping the Yonaguni Monument. There's nothing here that indicates an advanced Atlantis-type of civilization, as Graham Hancock wants his readers to believe. 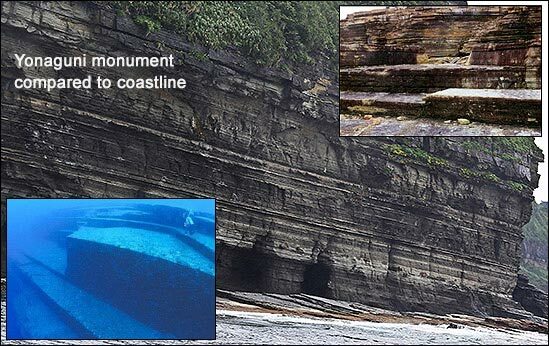 Looking at the coast of Yonaguni, it becomes very much the question if the monument really was ever even altered by humans or if it simply is a natural formation. The cliffs at Yonaguni have a tendency to break off in straight lines and at 90 degree angles, something that is not unheard of in other places of the world either. Yonaguni remains intriguing, but not as a remnant of anything Atlantis-related. Megalithic site Gobekli Tepe in Turkey has indeed been dated to 10,000 B.C. and older, which would make it the oldest type of dolmen or megalithic site known to man. Germany's Goseck Circle dates to 4,900 B.C. and the vast majority of the thousands of dolmen in Eurasia were built starting roughly around 4,000 B.C. All these facts and more have been taken up in ISGP's historical timelines. That having been said, there's nothing at Gobekli Tepe that really changes the historical timeline of the world. Primarily, there's no evidence of writing at Gobekli Tepe, which was only invented in 3,500 B.C., along with the first great civilizations. Gobekli Tepe is simply an early local megalithic phenomenon, albeit it a very large one. While some religious individuals have pointed out the fact that Gobekli Tepe is located close to the biblical Garden of Eden, at the source of the Euphrates, Tigris, Pishon and Gihon rivers, there's an overwhelming amount of evidence pointing to Africa as the origin of Early Modern Human (EMH) and Anatomically Correct Human (ACH). Graham Hancock is a great supporter of Charles Hapgood, his Earth's Crust Displacement/Pole Shift theory, and his analysis that the Piri Reis map shows an Antarctica without ice, mapped by people prior to 4,000 B.C. The entire first chapter of Hancock's Fingerprints of the Gods book is devoted to the Piri Reis map. So, what are the facts? While the earlier discussed Earth's Crust Displacement/Pole Shift theory, which Hancock still believes in, was first proposed by Manuel Velikovsky in 1950, it was Harvard professor Charles Hapgood who became the most prominent advocate in 1958 with his book The Earth's Shifting Crust. The foreword of the book was written by Albert Einstein, who was "electrified" by the idea that Hapgood may have found the reason behind sudden historical climatic changes. The problem is, today we know that these climate changes were primarily initiated by asteroid impacts and volcanic mega-eruptions Likewise, in the early to mid-1950s scientists were still absolutely puzzled by emerging evidence that continents are continually drifting apart (continental drift). Hapgood was among those who dismissed this idea, instead proposing that the outer layer of the earth is shifting over a molten, inner layer. However, in 1958 the now thoroughly verified (and rival) plate tectonics theory was introduced, and Hapgood's ideas were soon not given any attention anymore. In addition, further research has shown that never in the last billion years has there been a rapid and catastrophic pole shift. It appears there's an organized effort to keep Velikovsky alive in fringe alternative circles. Just the other day I noticed that on June 13, 1999 David Talbott, author of the Immanuel Velikovsky Reconsidered series, was invited to Coast to Coast AM. Then, in 1966, Hapgood's book Maps of Ancient Sea Kings was published. It promoted the idea that the Piri Reis map of 1513 shows parts of Antarctica and coast lines as they were during the last age. These conclusions don't make any sense, however. First, looking at a map of the Antarctic bedrock, it looks completely different than the coast drawn on the Piri Reis map. As for the Piri Reis map, the coasts of Africa and North-East South America are mapped in great detail, but everything else in North, Central and South America is just a rough sketch of what explorers were likely to find. If Antarctica was depicted on this map, it would have begun around Rio de Janeiro. The thing is, it's not Antarctica. No fine details are drawn in this part of the map, simply because the only thing explorers knew at the time was that the coastline continued further south. Even the areas in Central America that Columbus first explored 20 years earlier are barely recognizable. North America doesn't appear on the map either. Piri Reis map. The coast of Europe, West Africa and North-East South America are very accurate, complete with the proper animals drawn in. All the rest is completely wrong, including North and Central America. "Antarctica", which starts around Rio, apparently has cat and deer-like mammals living there. Hapgood also promoted the 1531 Oronteus Finaeus map as depicting Antarctica in its entirety. However, the map instead depicts the well known hypothetical continent Terra Australis. Australia, discovered in 1606, ended up being named after Terra Australis, as Antarctica wasn't discovered for another two centuries, in 1820. Looking closely at the the Oronteus Finaeus, the outlines of the continent don't match Antarctica. Without knowing anything about Hapgood, ISGP looked for two things: ties to Edgar Cayce and/or ties to intelligence. It may just be a coincidence, but Hapgood had both. During World War II Hapgood was OSS (the later CIA) and acted and as a liaison between the White House and the secretary of war. He also extensively worked with Elwood Babbitt, a trance medium educated by the Edgar Cayce Association, and the new age apocalyptic cult, Brotherhood of the Spirit. With his students Hapgood did studies into the lost continents of Mu and Atlantis. These concepts, and Atlantis in particular, have been completely discredited in an earlier ISGP article. In 1972 Hapgood's book Mystery in Acambaro was published, based on the extremely questionable Acambaro figures. In it, Hapgood argues that the figures prove that men and dinosaurs existed together in the same era. That's interesting, because dinosaurs died out 65 million years ago when even the most primitive apes didn't exist yet. Hapgood's book was reprinted in 2000 by Coast to Coast AM veteran David Hatcher Childress, whose other books, as well as those put out by his publishing firm, Adventures Unlimited Press, have put out a vast stream of books on Atlantis and other sunken continents, hollow earth, UFOs, the Indian vimanas, bigfoot, the Knights Templar and Tesla. It's all complete disinformation. In 3,300 B.C. the Indus Valley written script was invented, from which in later millennia the Mahabharata, its Bhagavad Gita, and the Ramayama sacred texts emerged. All of this information has been taken up in ISGP's historical timelines. These texts are rather vague, nonsensical mythological books, harder to read than even the bible. In contrast to the 1980s and 1990s, today it is possible to instantly search the entire English translation of the Mahabharata and even check it line by line with the original Sanskrit. Conclusion? The above text is a complete fabrication. Not only have completely separate sections and books been lobbed together, the translations themselves are completely inaccurate. For example, compare the "ten thousand suns" phrase with the original: "... that terrible deity robed in skins, looking like 10,000 Suns, and shrouded by the fire of superabundant Energy, blazed up with splendour." Then in a previous section of the book: "Day by day strong winds blew, and many were the evil omens that arose, awful and foreboding the destruction of the Vrishnis and the Andhakas. The streets swarmed with rats and mice. Earthen pots showed cracks or broken from no apparent cause. At night, the rats and mice ate away the hair and nails of slumbering men." And from an entirely different book of the Mahabharata: "When the next day came, Camva actually brought forth an iron bolt through which all the individuals in the race of the Vrishnis and the Andhakas became consumed into ashes." As anyone can see, no nuclear bombs were ever described in the Mahabharata. Related to these false Mahabharata citations, in early 2005 an article appeared on the internet talking about nuclear radiation having been found in the Pakistan-India desert, specifically to the west of Indian city Jodhpur. The article has been copy-pasted all over the internet since then. It was written by Philip Coppens, who has been featured on History Channel's Ancient Aliens, in Nexus Magazine and on Coast to Coast AM. The problem is, this is where India has been carrying out its nuclear tests. And that also explains past reports/rumors of spots where sand fused into glass have been found in the desert. In the same article of Coppens, he talks about archeological evidence at ancient Indus Valley cities Harappa and Mohenjo-daro, located on the other side of the Thar desert, of people having died in the streets in an instant. Problems with these claims: 1) no radiation has been found; 2) only several dozen skeletons were found, who appear to have died in different eras under circumstances that have always been heavily debated;  3) there's no evidence of the city's structures being leveled at the same time; and 4) these cities only flourished around 2,600 B.C. Language was first discovered here in 3,300 B.C. Before that, there was basically nothing but small settlements here and there. Hancock extensively writes about the Latin American ruins in his 1995 book Fingerprints of the Gods, but the only thing he does, as usual, is purposely confuse people. Whenever there's doubt on the date or origins of a certain city, he jumps on it. Whenever there's a myth of negroes or Phoenicians having made it to the Americas, he puts it in the book. Basic knowledge of astronomy and the seasons is blown out of proportion. And on it goes. Basically the only correct argument he makes is that many Latin American cultures were very much preoccupied with human sacrifice. In fact, the situation appears to have been even worse than Hancock describes. In contrast to his work on Ancient Egypt, at no point does Hancock seriously try to make the case that an advanced Latin American culture goes back to the last Ice Age. Therefore I think it will suffice to just copy-paste the timeline in ISGP's World History in Timelines article. I'd be surprised if Hancock would really disagree with it. A small group of 10-20 Early Modern Humans (EMH) cross the Bering Strait into North America. Early Modern Humans (EMH) has certainly reached South America. Farmers appear in South America. Oldest estimate of Bruce Masse et al. of the Rio Cuarto impact craters in Argentina with an estimated combined impact force of 1,000 tons, or 50,000 Hiroshima atomic bombs. Two of the craters are 3.5 km long and 700 meters wide (2.2 miles long and almost half a mile wide). The impacts scorch an area of roughly 100 by 500 km. (60 by 300 miles) and are likely to have killed primitive Indians. The impact happened at the latest around 2,000 B.C. The Caral civilization begins to flourish on the coast of Peru. It builds roughly two dozen very wide but low pyramids. There's no indication that Caral, which inhabited about 3,000 people, was a violent community. The civilization will last to about 2,000 B.C. with evidence that some of its achievements lasted until the days of the Incas, who arose 3,500 years later. Campo del Cielo meteorite impact in Argentina of an estimated 2-3 megatons. At least 26 craters are formed, the largest with a diameter of 115 meters (375 feet). The meteorite pieces left behind will serve as an important source of metal for local indians in millennia to come. Slow rise of the Maya culture in Central America. Already signs of an upcoming civilization around 2,600 B.C., as was the case with Chavin culture along the coast of Peru. Rise of the Olmec culture in Central America. They become cultured earlier than the Mayans and follow a 365 day year. Evidence of human/infant sacrifice in different places. There exists some confusion over the Olmec heads, as most seem to depict Negroes and Asians. However, even today there are still Indians with very thick lips or almond-shaped eyes. These traits are inherited from the Inuit in Alaska. DNA evidence doesn't reveal any African connections. Building starts at Chavín de Huantar, a ceremonial center of the Chavin people in western Peru at an elevation of 3,000 meter (10,000 ft). The influence of the Olmec city San Lorenzo declines after 300 years of prosperity. La Venta takes over as the dominant Olmec city. Founding of the city of Monte Alban in Mexico. The early Danzantes stone, at least in part depicting tortured sacrificial victims, have very distinct Olmec traits. However, the city is primarily associated with Zapotec civilization, which existed here until about 750 AD. Collapse of the Olmec city of La Venta. Chavin culture in western Peru is also collapsing. Rise of the Epi-Olmec culture, a mix of the Olmec and Veracruz cultures. It has more sophisticated calendrics and writing system, but there's a decline in the artisanship, refinement, and detail of sculptures. Teotihuacan, a civilization with unknown origins, starts to rise in Mexico. The largest pyramid, the Pyramid of the Sun, is completed only in 200 AD. The Temple of the Feathered Serpent (Quetzalcoatl) is build around the same time. It is unknown who these people were exactly. The temple names come from the later Aztecs. Nazca culture begins to flourish in Peru. They create the Nazca lines in 400-650 A.D. They are feverish headhunters. The Mayans in Central America began to urbanize and over time build many of the now remaining temple-pyramids: Lamanai, Coba, Caracol, Calakmul, Palenque, Uxmal, Tikal and Chichen Itza. Tiahuanaco (Tiwanaku) culture rises as a center of power in Bolivia, around Lake Titicaca. It precedes the Incas. Puma Punku will be build around 550 and disappear suddenly in 1000 A.D.
Rise of Toltec culture in Central America. It is considered a predecessor of the Aztecs. Mayan culture collapses after 7 centuries at its height, seemingly due to extreme drought. Only a few cities keep things together. Chichen Itza (with the Temple of Kulkulkan and its 365 stair steps) flourishes late, from 600 to 1220 AD. Then power shifts to the Mayan city Mayapan until a revolt breaks out in 1450. The Spanish have to subdue almost every single independent city/polity. The mayans know about the spring equinox. Vikings discover North America via Greenland. Small Viking settlements exist until the mid-1450s. Natives prevent any major expansions of the Vikings. Rise and quick demise of the Aztecs in Central America. King. Warriors had high status. Violent, conquering nation that tried to capture as many enemies for human sacrifice and receiving tribute. Cannibalism was widespread, with public fattening/butcher houses available in many towns. Quetzalcoatl Ololiuqui (LSA; Morning Glory seeds; not considered particularly insightful, an a ton of nausea) an mushrooms were used by Montezuma's circle and such (teonanácatl). Gold. Enough space and jungle between the Aztecs and Incas to avoid warfare until the Spanish came. Incas arise as a conqueror nation in South America in Peru, Ecuador and Chile. In 1450 they are thought to have built Machu Picchu. They also built the stone walls of Sacsayhuaman, with up to 200 ton rocks (some, if not all of these larger one were already in place; metal was used; and thousands of people were pulling the ropes to transport the stones). Emperor is God. Also practiced serious human sacrifice. Soon wiped out by the Spanish. Columbus arrives in America. During his later reign as governor responsible for up to 3 million deaths. Cortes arrives in Central America. 30 million indigenous people live in Mexico at this point. Only 1 million indigenous people are left in Mexico. Many have died from warfare with the Spanish, but even more have died from smallpox and other diseases. Mortality rates of smallpox among indians was up to 80-90 percent. edgarcayce.org/radio/index.aspx?id=1620: Podcasts can be listened to, but are undated. Webarchive reveals that Hancock was invited some time between November 14, 2012 and January 22, 2013. May 25, 2010 upload by David Wilcock, Youtube, 'David Wilcock Interviews Graham Hancock: Setting History Free!' Graham Hancock: "I just mention in passing here that gold [of the Ark of the Covenant] is a superb radiation shield. And the whole aura that surrounds this box in the Old Testament is of a dangerous and deadly object. If you touch it, you die. There are many accounts of people being struck dead by bolts of fire shooting out of the Ark. ... If I were asked to place a bet on this, my bet would be that the Ark of the Covenant is an out of place artifact. That it is a piece of technology, a piece of high technology. Now, I trace that back through the lineage of Ancient Egypt. Objects like the Ark of the Covenant are found in other Egyptian traditions. ... The people who could build the pyramids, who could move gigantic blocks of stone that weight hundreds of tons [note: not the case at the pyramids] as if they weight no more than a feather, those Egyptians clearly could a lot of things that we can't do today. ... Where they got it from, I don't go there. I don't speculate. But I do argue that they were the masters of a sacred technology. A kind of magic. And that this was manifested in the Ark of the Covenant. And the Ark of the Covenant was taken out of that system and carried off to Israel, but it continued to be a powerful object. I think that they absolute did [the Knights Templar trying to get the Ark to gain power]. Well, it is the power of God. ... If you can direct and control divine power in some way.... There's only one country in the world where the Ark is still venerated as an object and that is in Ethiopia and they have become masters of concealment." As for the genetic evidence: 2002, Dr. Spencer Well, 'The Journey of Man: A Genetic Odyssey'. In 2004 this book was turned into a TV documentary, which can be found on Youtube. *) The inventory Stela can give a person a headache: 1) Orthodox Egyptologists ignore it; 2) Hancock and co. only prefer to use it as evidence that the Sphinx predates Khufu, while ignoring the Great Pyramid in this instance. *) 1906 translation as given by Egyptologist James Henry Breasteds, 'Ancient Records of Egypt': "Live the Horus: Mezer [the living Pharaoh, Khufu – Horus initially was considered the brother of Isis and Osiris and later their son], King of Upper and Lower Egypt [united under the 1st Pharaoh in 3,150 B.C. ]: Khufu, who is given life. He found the house of Isis [equated to the Sirius star, close to Orion/Osiris], Mistress of the [Great] Pyramid, beside the house of the Sphinx [correct, immediately to the north] of [Harmakhis] on the north-west [south-east] of the house of Osiris [Giza pyramids, according to Zahi Hawass, but only the Great Pyramid existed at the time of Khufu. This makes sense, as Giza/Osiris are linked to Orion], Lord of Rosta. He built his pyramid [Great Pyramid] beside the temple of this goddess, and he built a pyramid for the king's-daughter Henutsen [G1-c, one of the Khufu Pyramids small queen pyramids right next-door] beside this temple." *) It appears that the Stela is not a literal word-for-word translation of an older text, this because of words not used in the Old Kingdom. 1949, Selim Hassan, 'The Sphinx: Its History in the Light of Recent Excavations', pp. 88-91: "In my opinion, the Great Sphinx of Giza was erected after the completion of the Khafra Pyramid Complex; the evidence which leads me to this conclusion being a trench which runs down the northern side of the Causeway of the Second Pyramid. This trench, which measures about 2 metres wide and 1-50 metres deep, is cut in the rock, and serves as a division between the Necropolis of Khufu on the north, and that of Khafra on the south. The marking of boundaries by means of trenches may be seen in the case of rock-cut mastabas, where thev occur in the upper surface of the rock to define the limits of the tomb. In the case of the trench we are discussing, it stops abruptly at the western edge of the cavity of the Sphinx (see Plan, Fig. 2). Now, in the case of a heavy rainfall, this trench would act as a drain, and discharge all its dirty water into the cavity of the Sphinx. 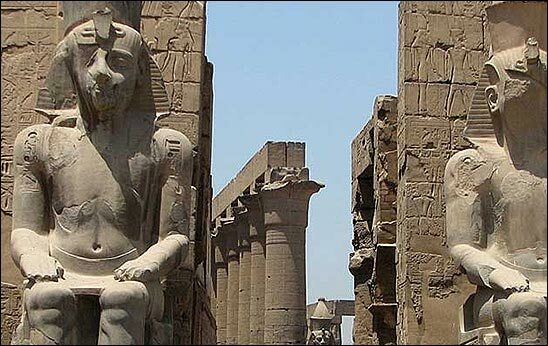 This seems to be clear proof that the Sphinx was cut after the completion of the causeway, for had it existed before, the trench would never have been continued right to the edge of the cavity, it being unthinkable that the sacred enclosure of the God should become the receptacle for drainage water, even periodically. However, when the Sphinx was cut, this state of affairs became unavoidable; therefore, the architects did their best by plugging the end of the trench with great blocks of granite, and this forms a convincing proof that the Sphinx was a later addition to the Khafra Pyramid Complex, but not necessarily belonging to it. This, then, seems to limit the age of the Sphinx to the latter end of the reign of Khafra at the very most. Moreover, the details of the statue are all in keeping with the style of the Old Kingdom sculpture. Further, as we have already seen, the Sphinx antedates the rock-cut tombs in the walls of the amphitheatre, while the style of its temple is beyond all doubt that of the IVth Dynasty. As the pedestal of the Sphinx actually forms the lower part of the western wall of this temple, I think we cannot but accept this fact as putting the very lowest limit to the age of the Sphinx, as the middle of the IVth Dynasty. Further facts in favour of this theory are as follows :— (1) That the Great Sphinx is later than Khufu can be seen by the evidence of the trench in the causeway, which makes it practically certain to have been cut after the completion of the causeway. (2) If we are to regard the Sphinx as the representation of the King-God, then we must look for its originator in the king whose pyramid and temples lie nearest to it, and here again the evidence points to Khafra. (3) It can hardly belong to Men-kaw-Ra, the builder of the Third Pyramid, for two reasons : First, it is far from his Pyramid Complex, and secondly, he was unable to finish even his own pyramid and temples. (4) That Khafra was responsible for the erection of the Sphinx seems all the more probable when we study the plans of the Temple of the Sphinx and the Valley Temple of Khafra (see Plan, Fig. 2). It seems quite evident that the two buildings are part of one gigantic scheme. Therefore, taking all these things into consideration, it seems that we must give the credit of having erected this, the world's most wonderful statue, to Khafra, but always with this reservation, that excepting for the mutilated line on the Granite Stela of Thothmes IV, which proves nothing, there is not one single ancient inscription which connects the Sphinx with Khafra. So sound as it may appear, we must treat this evidence as circumstantial until such a time as a lucky turn of a spade will reveal to the world definite reference to the erection of this statue." 440 B.C., Herodotus, 'The Histories', Book 2, (Translation by Pamela Mensch and edited by James Romm, pp. 124-127): "Cheops [Khufu], according to the priests, plunged Egypt into utter misery. Shutting up all the temples, he prevented the Egyptians from sacrificing, and pressed them all into royal service. Some were assigned to haul stone to the Nile from the quarries in the Arabian mountains. When the stone was ferried across the river, Cheops [Khufu] stationed others to receive and haul it to the Libyan hills. The Egyptians labored in gangs of 100,000 men, each gang assigned for a three-month shift. It took them ten years to build the road used for hauling the stone. This road, it seems to me, required hardly less effort to build than the pyramid. ... To build the pyramid itself took twenty years. ... It is built entirely of polished stone blocks, fitted together meticulously, none of the blocks being less than 30 feet long. ... The Egyptians said that Cheops reigned for fifty years. When he died, his brother Chephren succeeded to the throne. Chephren emulated his brother in many respects. He, too, built a pyramid, though his was smaller than his brother's. (I measured them both myself.) Chephren's has no underground chambers, nor a canal, as the other has, to supply it with water. But water from the Nile, channeled through an aqueduct, surrounds the pyramid where the body of Cheops is said to lie, and makes the site an island. ... They calculate that Egypt's misery lasted for 106 years, during all of which time the temples were shut and never opened. So hated were these kings that the Egyptians actually refuse to mention their names. Instead, they call the pyramids after Philitis, a shepherd who at that time pastured his flocks in the neighborhood." Ca. 77-79, Pliny the Elder, 'Natural History', Book XXXVI (36), Chapter 17: "We will mention also cursorily the Pyramids, which are in the same country of Egypt, — that idle and foolish exhibition of royal wealth. For the cause by most assigned for their con- struction is an intention on the part of those kings to exhaust their treasures, rather than leave them to successors or plotting rivals, or to keep the people from idleness. Great was the vanity of those individuals on this point. There are traces of a great number of Pyramids begun and left unfinished. ... The largest (3) Pyramid is built of stone quarried in Arabia: three hundred and sixty thousand men, it is said, were employed upon it twenty years, and the three were completed in seventy-eight years and four months. They are described by the following writers: Herodotus [d. 425 B.C. ], (4) Euhemerus [lived +-300 B.C. ], Duris of Samos [d. +-280 B.C. ], Aristagoras [lived +-500 B.C. ], Dionysius, Artemidorus [lived +-100 B.C. ], Alexander Polyhistor [lived +-75 B.C. ], Butoridas, Antisthenes [lived +-400 B.C. ], Demetrius, Demoteles, and Apion [lived +- 0]. These authors, however, are disagreed as to the persons by whom they were constructed; accident having, with very considerable justice, consigned to oblivion the names of those who erected such stupendous memorials of their vanity. Some of these writers inform us that fifteen hundred talents were expended upon radishes, garlic, and onions (5) alone." 1980, Zecharia Sitchin, 'The Stairway to Heaven, Book II of the Earth Chronicles', pp. 332, 346-352. "Determined to run his own show, Vyse moved from Cairo to the site of the pyramids. "I naturally wished to make some discoveries before I returned to England," he admitted in his journal on January 27, 1837. At great expense to his family, he was now gone for well over a year. ... As it turned out, Vyse secretly entered the Great Pyramid on the night of February 12, accompanied by one John Perring... The circumstances of Vyse launching into this adventure of discovery, his treatment of Caviglia, the chronology of events, his determination to obtain a major find as time and money were running out—bespeak a character capable of such a deed. [faking the workmen's graffiti]"
2003, Stargate, Ultimate Edition DVD, interview with director Roland Emmerich and producer Dean Devlin. The 1994 movie Stargate was followed by miniseries: 1) Stargate SG1 (1997-2007); 2) Stargate Atlantis (2004-2009); and 3) Stargate Universe (2009-2011). The initial movie was heavily influenced by Zecharia Sitchin, John Anthony West and Robert Schoch. 1994, Stargate movie, starting about 6:45 minutes into the film. Dr. Daniel Jackson speaking at the "Symposium Ancient Egypt": "[Dr. Daniel Jackson, portrayed by a 24-year-old James Spader:] When is the academic community going to accept the fact that the pharaohs of the 4th dynasty did not build the Great Pyramid? [crowd gets rowdy] Look, look, inside the Great Pyramid, the most incredible structure ever erected, there are no writings whatsoever. ... [Participant:] Dr. Jackson, you left out the fact that Colonel Vyse discovered quarrymen's inscriptions of Khufu's name within the pyramid. [Dr. Daniel Jackson:] Well, his discovery was a fraud. [Participant:] I how you can prove it. [Another participant:] Who do you think built the pyramids? [Dr. Daniel Jackson:] I don't have any idea who built them. [Participant:] You mean from Atlantis? Or Martians perhaps? [Dr. Daniel Jackson:] That's not the point. The point is when they were built. [Crowd leaves.] As you all know, new geological evidence dates the Sphinx back to a much earlier period. And knowing this, I think we have to begin to reevaluate everything that we have come to accept about. I've been able to show a fully developed writing system appeared in the first two dynasties. You know, almost as if it is was based on an even earlier ... Is there a lunch or something?" Later in the movie it becomes clear the Egyptian god Ra built the Great Pyramid with high technology. Jackson is recruited into a secret government project after this speech. *) June 1999, Vol. 40, Anthony Patrick Fairall (1943-2008; an experienced professor at the University of Cape Town and director of Cape Town Planetarium) for Astronomy & Geophysics, the journal of the Royal Astronomical Society (RAS) in England, 'Precession and the layout of the ancient Egyptian pyramids' (pdf file): "The pyramids have a strong astronomical association. The four faces of an Egyptian pyramid are precisely aligned with the four cardinal points of the compass. Given that the Egyptians never recognized a north pole on the Earth, they could have only done this by means of the rotation of the sky about the North Celestial Pole. The most obvious way of fixing azimuthal north would be by the symmetry of the rising and setting points of stars. The great pyramid of Khufu is level to a centimetre and aligned to a twentieth of a degree, a tribute to the accuracy of ancient surveying skills. Khufu's pyramid also contains four "star shafts", aimed towards the meridian in the sky. When the pyramid was built (c. 2500 BC), these shafts aimed at the transitpoints of Thuban (Alpha Draconis - then pole star), Orion's Belt, Sirius and Kochab (Beta Ursa Minoris), clearly intentionally and not coincidentally. The shafts apparently served to direct the ka, or spirit, of the dead pharaoh towards these key stars. Thuban and Kochab were circumpolar "Imperishable ones" (stars that never die), Orion represented the deity Osiris, and Sirius his consort, Isis." *) 1992, Virginia Trimble, 'Visit to Small Universe', published by the American Institute of Physics, pp. 3-9 (based on research published in 1964 by Egyptologist Alexander Badawy and astronomer Virginia Trimble): "Among the most obvious [unique features of the Great Pyramid] are two shafts leading north and south out of the King's Chamber… The [north] shaft points very neatly toward the celestial pole, about which the circumpolar stars seem to revolve. It is also of interest to note that at the time the pyramid was built, the pole was marked by a bright star [Thuban, or Alpha Draconis] about as accurately as Polaris (Ursae Minoris) now marks it. … In this scheme of moving stars, pole stars are a rather rare occurrence. In fact, after Polaris ceases to mark the pole in a few hundred years, there will not be another good one until Draconis [Thuban: the Arabic word for snake; it was the pole star from 4,000 B.C. to 1,900 B.C.] returns around A.D. 23,000. It happens, however, that the last "visit" of Draconis to the neighborhood of the pole occurred from about 3000 to 2500 B.C. … It thus seems highly probable that they would have chosen to build a shaft that would allow the soul of their dead king to ascend directly to this central point. … Tables and recent calculation by the same method show that one of the three stars in Orion's belt had a declination within 30' of 15.5 degrees (2840 to 2480 BC). … This means that these three [Orion] stars, whose importance to the Egyptians we have seen [meaning: Osiris and the Duat], passed once each day, at culmination, directly over the southern shaft of the Great Pyramid at the time it was built." *) 2003, Dr. Zahi Hawass for his old personal website, guardians.net, 'The Secret Doors Inside the Great Pyramid': "Egyptologists have multiple explanations for these shafts [of the Queen's Chamber]. Some believe that they were used for ventilation, but this cannot be true as they do not open up to the outside. Others believe that they have an astronomical function; the southern shaft connected to the star Sirius, and the northern shaft linked to Minoris, Ursa, and Beta [Beta Ursae Minoris, or Kochab - an important navigational star]. Stadelmann believes that these shafts are not for ventilation, but are tunnels through which the king's soul will rise to the stars that never darken. I believe that the shafts from the so-called Queen's Chamber likely have no function, as they were blocked from the inside. If they had a religious function, they should have been left open, as were the shafts of the third burial chamber (the King's Chamber). Since these open outside of the pyramid, I believe that Khufu's soul was meant to travel through them. The south shaft [of the King's Chamber, towards Orion/Duat/Osiris] was intended for Khufu to use as the sun god Ra. The south shaft opens exactly between the two boat pits to the south of the Pyramid. Khufu would take the two boats and use them as solar boats – one for the day trip, one for the evening trip. The north shaft [to the pole star, Alpha Draconis/Thubans] was made for the soul of Khufu as Horus to travel to the stars in order to emerge from them as the sun god. In order to understand the purpose of the shafts of the so-called Queen's Chamber, more work had to be done. Egyptologists have multiple explanations for these shafts. Some believe that they were used for ventilation, but this cannot be true as they do not open up to the outside. Others believe that they have an astronomical function; the southern shaft connected to the star Sirius, and the northern shaft linked to Minoris, Ursa, and Beta. Stadelmann believes that these shafts are not for ventilation, but are tunnels through which the king's soul will rise to the stars that never darken." *) Sometimes alternate historians argue that Egyptologist Sir Flinders Petrie didn't make the most accurate measurements of the Great Pyramid's shafts, which were subsequently used by scientists Virgina Trimble and Alexander Badawy in 1964 to figure out at which stars the shafts pointed in the 26th century B.C. As the reader can see below, there only exist small variations between the measurements of Petrie in 1880 and Rudolf Gantenbrink in 1993, with not being exactly clear who has the better measurement in each case, at least not based on information from publicly available sources. In all cases the fact remains that the shafts aligned with the afore-mentioned stars somewhere around the 26th century B.C., which is not the case when we go back, let's say, to 10,500 B.C. *) 2007, Jay B. Holberg (senior research scientist, Lunar and Planetary Laboratory, University of Arizona), 'Sirius: Brightest Diamond in the Night Sky', p. 4: "Sopdet was the star Sirius, and the celestial manifestation of the goddess Isis. The stars of Osiris, god of the Nile and rebirth, are part of the constellation Orion that rises just prior to Sirius. Isis and Osiris had once again returned from the duat, or underworld." What follows are excerpts of the Pyramid texts, which were extremely elaborate funeral rites/spells to help guide the pharaoh through the Duat and towards Orion. The texts quoted are Old Kingdom and from roughly 200 years after Khufu finished the Great Pyramid. *) Pharaoh Pepi I (2,332 – 2,283 B.C.) Pyramid Text, utterance 442, 'The king becomes a star': "Your hand is grasped by Re [Ra]. Your head is raised by the two Enneads [group of gods]. Behold, he has come as Orion, Osiris has come as Orion. Lord of wine and the wag-fest. ... You shall live! You shall rise with Orion in the eastern sky. You shall set with Orion in the western sky. Your third is Sothis [Isis], pure of thrones. She is your guide on the sky's good paths." *) 2005, James P. Allen, 'The Ancient Egyptian Pyramid Texts', Chapter 2: The Pyramid texts of (Pharaoh) Pepi I (2,332 – 2,283 B.C. ): "Osiris has gone to be with his ka [spirit]; Seth has gone to be with his ka; ... you too [Pepi] have gone to be with your ka. ... You shall [row] and go around the sky [which has] been swept for you and a path [has been] laid down [for] you away from the Duat and toward the place where Orion is. ... Ho, Pepi! You are the big star that is Orion's companion, who travels the sky with Orion and rows the Duat [underworld] with Osiris. You shall emerge in the eastern side of the sky, renewed at your proper season and rejuvenated in your time, Nut having given you birth with Orion, the year having put your headband on you with Osiris. Arms will wave for you, drumming (feet) will go down for you, you will be given a repast, and the Great Mooring-Post will scream for you as (for) Osiris in his activity. Ho, Pepi! Row [the boat] and reach (the sky, but) beware of the Great Lake [the Duat]! ... Tremble, sky; shake, earth—before this [Pharaoh] Pepi! Pepi is Magic, Pepi is one who has magic. This Pepi has come that this Pepi might akhify Orion, that this Pepi might bring Osiris to the fore, that this Pepi might put the gods on their seats. Sees Behind Him, the gods' bull, get that (ferryboat) for this Pepi, put this Pepi on the other side!" *) 2005, James P. Allen, 'The Ancient Egyptian Pyramid Texts', Chapter 2: The Pyramid texts of (Pharaoh) Teti (2,345–2,333 B.C. ): "Osiris Teti, Horus [son of Osiris] has come to you that he might gather you: you are his father. ... Stand up! Raise yourself like Osiris! Ho, Osiris Teti! Horus has come seeking you. He has made Thoth drive back Seth's [Osiris' brother] followers for you... You are greater than he, for you have emerged in precedence to him and your character has precedence over him. ... Geb [father of Isis] has gotten for you your two sisters to your side—they are Isis [normally normally Osiris' wife] and Nephthys. Horus has made the gods join you: they shall be brotherly to you... Ho, Osiris Teti! Horus has tended you. He has acted for his ka [spirit] in you, that you might become content in your identity of Ka At Rest. Ho, Osiris Teti! Geb has given you your eyes: ... Isis and Nephthys tend you, and they have given you to Horus, that he may be content with you. ... Ho, Osiris Teti! Elevate yourself to Horus, betake yourself to him: don't be far from him." *) 2003, Dr. Zahi Hawass for his old personal website, guardians.net, 'The Secret Doors Inside the Great Pyramid': "The south shaft [of the King's Chamber, towards Orion/Duat/Osiris] was intended for Khufu to use as the sun god Ra. The south shaft opens exactly between the two boat pits [to navigate the Duat, or underworld] to the south of the Pyramid. Khufu would take the two boats and use them as solar boats – one for the day trip, one for the evening trip. The north shaft [to the pole star, Alpha Draconis/Thubans] was made for the soul of Khufu as Horus to travel to the stars in order to emerge from them as the sun god." *) c14dating.com/int.html (accessed: June 17, 2014): "The historical perspective on the development of radiocarbon dating is well outlined in Taylor's (1987) book "Radiocarbon Dating: An archaeological perspective". Libby and his team initially tested the radiocarbon method on samples from prehistoric Egypt. They chose samples whose age could be independently determined. A sample of acacia wood from the tomb of the pharaoh Zoser (or Djoser; 3rd Dynasty, ca. 2700-2600 BC) was obtained and dated. Libby reasoned that since the half-life of C14 was 5568 years, they should obtain a C14 concentration of about 50% that which was found in living wood (see Libby, 1949 for further details). The results they obtained indicated this was the case. ... In 1949, Arnold and Libby (1949) published their paper "Age determinations by radiocarbon content: Checks with samples of known age" in the journal Science." *) 2010, Mark Lehner (came to Egypt on a Cayce Foundation scholarship, but slowly came to renounce Cayce's theories and became a close friend and colleague of Zahi Hawass for decades), Ancient Egyptian Research Association (aeraweb.org), 'How Old are the Pyramids? ': "The earliest experiments in radiocarbon dating were done on ancient material from Egypt [in 1948-1949]. Willard F. Libby's team obtained acacia wood from the 3rd Dynasty Step Pyramid of Djoser to test a hypothesis they had developed. Libby reasoned that since the half-life of C14 was 5568 years, the Djoser sample's C14 concentration should be about 50% of the concentration found in living wood (for further details, see Arnold and Libby, 1949). The results proved their hypothesis correct. Subsequent work with radiocarbon testing raised questions about the fluctuation of atmospheric C14 over time. Scientists have developed calibration techniques to adjust for these fluctuations." *) 2010, Mark Lehner (came to Egypt on a Cayce Foundation scholarship, but slowly came to renounce Cayce's theories and became a close friend and colleague of Zahi Hawass for decades), Ancient Egyptian Research Association (aeraweb.org), 'How Old are the Pyramids? ': "In 1984 we conducted radiocarbon dating on material from Egyptian Old Kingdom monuments (financed by friends and supporters of the Edgar Cayce Foundation). We then compared our results with the mid-point dates of the kings to whom the monuments belonged (Cambridge Ancient History, 3rd ed.). The average radiocarbon dates were 374 years earlier than expected [due to the re-use of old wood, Lehner later found out]. In spite of this discrepancy, the radiocarbon dates confirmed that the Great Pyramid belonged to the historical era studied by Egyptologists." *) 2010, Mark Lehner (came to Egypt on a Cayce Foundation scholarship, but slowly came to renounce Cayce's theories and became a close friend and colleague of Zahi Hawass for decades), Ancient Egyptian Research Association (aeraweb.org), 'How Old are the Pyramids? ': "In 1994-1995 the David H. Koch Foundation supported us for another round of radiocarbon dating. We broadened our sampling to include material from: The 1st Dynasty tombs at Saqqara (2920-2770 BC). The Djoser pyramid (2630-2611 BC). The Giza Pyramids (2551-2472BC). A selection of 5th Dynasty pyramids (2465-2323 BC). A selection of 6th Dynasty pyramids (2323-2150 BC). A selection of Middle Kingdom pyramids (2040-1640 BC). We also took samples from our Giza Plateau Mapping Project Lost City excavations (4th Dynasty), where we discovered two largely intact bakeries in 1991. Ancient baking left deposits of ash and charcoal, which are very useful for dating. The 1995 set of radiocarbon dates tended to be 100 to 200 years older than the Cambridge Ancient History dates, which was about 200 years younger than our 1984 dates. Comparison 1984/1995: The number of dates from the two projects was only large enough to allow for statistical comparisons for the pyramids of Djoser, Khufu, Khafre, and Menkaure. There are two striking results. First, there are significant discrepancies between the 1984 and 1995 dates for Khufu and Khafre, but not for Djoser and Menkaure. Second, the 1995 dates vary widely even for a single monument. For Khufu's Great Pyramid, they scatter over a range of about 400 years." *) June 18, 2010, vol. 328, Science magazine, Christopher Bronk Ramsey, et al., 'Radiocarbon-Based Chronology for Dynastic Egypt', pp. 1554-1557: "We obtained short-lived plant remains from museum collections (e.g., seeds, basketry, plant-based textiles, plant stems, fruits) that were directly associated with particular reigns or short sections of the historical chronology. We avoided charcoal and wood samples because of the possibility of inbuilt age. We also avoided mummified material because of concerns about contamination from bitumen or other substances used in the mummification process and human material because of the possibility of riverine or marine components in the diet (which might contain older carbon). ... [measured/calculated pyramid dates, B.C. :] ... Djoser: ... 2691-2625; Sneferu: ... 2649-2582; Khufu: 2629-2558 [2580 B.C. is and remains conventional estimate]; Djedefra: ... 2610-2536; Khafra: 2604-2528; Menkaura: ... 2581-2504." All of these dates back up dates that were already estimated in the past. 2002 (estimated), Edgar Evans Cayce, 22 minute speech on ARE cd-rom (16:10): "Some of you may not know. The ARE sponsored an effort to carbon date the Great Pyramid. Of course, you can't carbon date stone, but you can carbon date any kind of organic matter that is in there. ... When the results did not go back as far as we hoped, we weren't able to get any samples from inside the pyramid, they only let you take samples from the outside, it did show that the structure was 400 years older than the Egyptian archeologists believed. And that kind of upset them, because the pharaoh they thought built it, didn't built it or he lived in a different time. Also, it showed that the blocks at the top were 400 years older than the bottom. That couldn't have been built from the top down, so that means that there have been repairs made, which is pretty good evidence that it is much older than they think." *) Explanation of Mark Lehner (came to Egypt on a Cayce Foundation scholarship, but slowly came to renounce Cayce's theories and became a close friend and colleague of Zahi Hawass for decades): The discrepancies in dating primarily showed up in trying to date charcoal in the pyramid's mortar. Ancient Egyptians continually re-used wood, which had become scarce. It appears charcoal of sometimes centuries old wood ended up in the pyramid's mortar during the process of heating and making it. See the note below. *) 2010, Mark Lehner, Ancient Egyptian Research Association (aeraweb.org), 'How Old are the Pyramids? ': "The old-wood problem Ancient Egypt's population was restricted to the narrow confines of the Nile Valley with, we assume, a sparse cover of trees. It is likely that, by the pyramid age, the Egyptians had been intensively exploiting wood for fuel for a long time. Because of the scarcity and expense of wood, the Egyptians would reuse pieces of wood as much as possible. Some of this recycled wood was burned, for example, in mortar preparation. If a piece of wood was already centuries old when it was burned, radiocarbon dates of the resulting charcoal would be centuries older than the mortar for which it was burned. We thought that it was unlikely that the pyramid builders consistently used centuries-old wood as fuel in preparing mortar. The 1984 results left us with too little data to conclude that the historical chronology of the Old Kingdom was wrong by nearly 400 years, but we considered this at least a possibility. Alternatively, if our radiocarbon estimations were in error for some reason, we had to assume that many other dates obtained from Egyptian materials were also suspect. This prompted the second, larger, 1995 study. ... If the Middle Kingdom radiocarbon dates are good, why are the Old Kingdom radiocarbon dates from pyramids so problematic? The pyramid builders often reused old cultural material, possibly out of expedience or to make a conscious connection between their pharaoh and his predecessors. Beneath the 3rd Dynasty pyramid of pharaoh Djoser, early explorers found more than 40,000 stone vessels. These vessels included inscriptions of most of the kings of the 1st and 2nd Dynasties, but Djoser's name occurred only once. Did Djoser gather and reuse vases that were already 200 years old from tombs at North Saqqara? In the 12th Dynasty, Amenemhet I (1991-1962 BC) left clear evidence of this kind of recycling. He took pieces of Old Kingdom tomb chapels and pyramid temples (including those of the Giza Pyramids) and dumped them into the core of his pyramid at Lisht." See the two Graham Hancock quotes at the top of this article. The only source for the Ark of the Covenant is the bible. Numerous conspiracy rumors aside, it has never been discovered in the ruins of Solomon's Temple nor anywhere else - like the Church of Our Lady Mary of Zion in Axum, Ethiopia. Hancock to David Wilcock: "We shouldn't be so arrogant and think we that we are the apex or pinnacle of human achievement. We may just be a blip in a very long story. The whole story of human history might by cyclical, not linear." 1995, Graham Hancock, 'Fingerprints of the Gods', pp. 19-20: "The 'idea' expressed in Hapgood's 1953 book is a global geological theory which elegantly explains how and why large parts of Antarctica could have remained ice-free until 4000 BC, together with many other anomalies of earth science. ... Further details of the evidence supporting these radical proposals are set out in Part VIII of this book. Orthodox geologists, however, remain reluctant to accept Hapgood's theory (although none has succeeded in proving it incorrect)." en.wikipedia.org/wiki/Pole_shift_hypothesis (accessed: August 31, 2014): "Pole shift hypotheses are not connected with plate tectonics... Pole shift hypotheses are not the same as geomagnetic reversal, the periodic reversal of the Earth's magnetic field (effectively switching the north and south magnetic poles). ... What is known as true polar wander, the solid Earth can rotate with respect to a fixed spin axis. Research shows that during the last 200 million years a total true polar wander of some 30° has occurred, but that no super-rapid shifts in the Earth's pole were found during this period. A characteristic rate of true polar wander is 1° per million years or less. Between approximately 790 and 810 million years ago, when the supercontinent Rodinia existed, two geologically rapid phases of true polar wander may have occurred. In each of these, the magnetic poles of the Earth shifted by ~55°." 1995, Graham Hancock, 'Fingerprints of the Gods', pp. 302-303: "Prior to the reigns of Khufu, Khafre and Menkaure [27th century B.C. ]there was not a single pharaoh whose name could be put forward as a candidate. Khufu's father Sneferu, the first king of the Fourth Dynasty, was believed to have built the so-called 'Bent' [2,600 B.C.] and 'Red' Pyramids [2,600 B.C.] at Dahshur, about thirty miles south of Gizaan attribution that was itself mysterious (if pyramids were indeed tombs) since it seemed strange that one pharaoh required two pyramids to be buried in. [The Bent Pyramid appears to have been corrected halfway through in fear of another collapse, as happened to Pyramid of Meidum in the same period] Sneferu was also credited by some Egyptologists with the construction of the 'Collapsed' Pyramid at Meidum [2,611 B.C.] (although a number of authorities insisted that this was the tomb of Huni, the last king of the Third Dynasty). 12 The only other builders in the Archaic Period had been Zoser, the second pharaoh of the Third Dynasty, to whom was attributed the construction of the 'Step Pyramid' at Saqqara [2,611 B.C. : Pyramid of Djoser], 13 and Zoser's successor, Sekhemkhet, whose pyramid also stood at Saqqara. Therefore, despite the lack of inscriptions, it was now assumed as obvious that the three pyramids at Giza must have been built by Khufu, Khafre and Menkaure and must have been intended to serve as their tombs. We need not reiterate here the many shortcomings of the 'tombs and tombs only' theory." See notes 11 to 14. And also ISGP's article on Atlantis. 1995, Graham Hancock, 'Fingerprints of the Gods', pp. 426-428: "The roots of Bauval's discoveries at Giza go back to the 1960s when the Egyptologist and architect Dr. Alexander Badawy and the American astronomer Virginia Trimble demonstrated that the southern shaft of the King's Chamber in the Great Pyramid was targeted like a gun-barrel on the Belt of Orion during the Pyramid Agearound 2600 to 2400 BC. 2 Bauval decided to test the southern shaft of the Queen's Chamber, which Badawy and Trimble had not investigated, and established that it had been sighted on the star Sirius during the Pyramid Age." Edgarcayce.org, Don Caroll for the ARE blog, 'The Stars Above, the Great Pyramid Below: 10,400 BCE': "Text of Edgar Cayce Reading 5748-6 (Q) What was the date of the actual beginning and ending of the construction of the Great Pyramid? (A) Was one hundred years in construction. Begun and completed in the period of Araaraart's time, with Hermes and Ra. (Q) What was the date B.C. of that period? (A) 10,490 to 10,390 before the Prince entered into Egypt." The prince is actually a reference to biblical figure Jacob, who (allegedly) lived a between one and three millennia or more before Christ, but Cayce's claim has apparently been widely interpreted as roughly meaning 10,500 B.C. 1995, Graham Hancock, 'Fingerprints of the Gods', pp. 426-428: "I found the implications of the Orion correlation complicated and eerie. On the one hand, the Great Pyramid's southern shafts 'precessionally anchored' the monument to Al Nitak and Sirius in 2475-2400 BC, dates which coincided comfortably with the epoch when Egyptologists said the monument had been built. On the other hand the disposition of all three of the pyramids in relation to the Nile Valley eloquently signalled the much earlier date of 10,450 BC. This coincided with the controversial geological findings John West and Robert Schoch had made at Giza, which suggested the presence of a high civilization in Egypt in the eleventh millennium BC. Moreover, the disposition of the pyramids had not been arrived at by any random or accidental process but seemed to have been deliberately chosen because it marked a precessionally significant event: the lowest point, the beginning, the First Time in Orion's 13,000-year up' cycle. ... My research into Ice Age mythologies had persuaded me that certain ideas and memories could linger in the human psyche for many millennia, transmitted from generation to generation by oral tradition. I could therefore see no prima facie reasons why the Osirian mythology, with its strange and anomalous characteristics, should not have originated as far back as 10,450 BC." 1995, Graham Hancock, 'Fingerprints of the Gods', pp. 285, 303: "Khufu ... Khafre ... Menkaure ... According to all orthodox Egyptologists the pyramids had been built as tombsand only as tombsfor these three pharaohs. Yet there were some obvious difficulties with such assertions. For example, the spacious burial chamber of the Khafre Pyramid was empty when it was opened in 1818 by the European explorer Giovanni Belzoni. Indeed, more than empty, the chamber was starkly, austerely bare. The polished granite sarcophagus which lay embedded in its floor had also been found empty, with its lid broken into two pieces nearby. 2 How was this to be explained? To Egyptologists the answer seemed obvious. At some early date, probably not many hundreds of years after Khafre's death, tomb robbers must have penetrated the chamber and cleared all its contents including the mummified body of the pharaoh. Much the same thing seemed to have happened at the smaller Third Pyramid, towards which Santha and I were now walkingthat attributed to Menkaure. Here the first European to break in had been a British colonel, Howard Vyse, who had entered the burial chamber in 1837. He found an empty basalt sarcophagus, an anthropoid coffin lid made of wood, and some bones. The natural assumption was that these were the remains of Menkaure. Modern science had subsequently proved, however, that the bones and coffin lid dated from the early Christian era, that is, from 2500 years after the Pyramid Age, and thus represented the intrusive burial' of a much later individual (quite a common practice throughout Ancient Egyptian history). As to the basalt sarcophaguswell, it could have belonged to Menkaure. Unfortunately, however, nobody had the opportunity to examine it because it had been lost at sea when the ship on which Vyse sent it to England had sunk off the coast of Spain. 3 Since it was a matter of record that the sarcophagus had been found empty by Vyse, it was once again assumed that the body of the pharaoh must have been removed by tomb robbers. ... Despite the lack of inscriptions, it was now assumed as obvious that the three pyramids at Giza must have been built by Khufu, Khafre and Menkaure and must have been intended to serve as their tombs. We need not reiterate here the many shortcomings of the 'tombs and tombs only' theory." 1995, Graham Hancock, 'Fingerprints of the Gods', p. 427: "Using a sophisticated computer programme 7 capable of plotting the precessionally induced changes in the declinations of all the stars visible in the sky over any part of the world in any epoch, Bauval found that the Pyramids/Orion's Belt correlation was general and obvious in all epochs, but specific and exact in only one: At 10,450 BCand at that date onlywe find that the pattern of the pyramids on the ground provides a perfect reflection of the pattern of the stars in the sky. I mean it's a perfect matchfaultlessand it cannot be an accident because the entire arrangement correctly depicts two very unusual celestial events that occurred only at that time. First, and purely by chance, the Milky Way, as visible from Giza in 10,450 BC, exactly duplicated the meridional course of the Nile Valley; secondly, to the west of the Milky Way, the three stars of Orion's Belt were at the lowest altitude in their precessional cycle, with Al Nitak, the star represented by the Great Pyramid, crossing the meridian at 11° 08'."" June 1999, Vol. 40, Anthony Patrick Fairall (1943-2008; an experienced professor at the University of Cape Town and director of Cape Town Planetarium) for Astronomy & Geophysics, the journal of the Royal Astronomical Society (RAS) in England, 'Precession and the layout of the ancient Egyptian pyramids' (pdf file): "This has suggested that the layout at Giza may be an attempt to portray Orion's Belt. If so, the orientation of the line, with respect to the cardinal points, is wrong – for 2500 BC. Precession, however, changes the angle that the Belt makes in the sky. Bauval claims that going back to 10 500 BC gives "a perfect match". Or does it? My own investigation showed that, while the line of the two outer pyramids is set 38° from north, the angle of Orion's Belt to north in 10 500 BC is close on 50°! Hardly an exact match. I calculate that circular precessional motion would give 47°, whereas including nutational terms makes it slightly higher. Bauval, on the other hand, appears to have used computer programs. He implies that only with modern sophisticated computers can we examine the ancient skies! I wonder if he also made the mistake of measuring angles off a flat screen. ... Finally, as my colleague in the planetarium world Ed Krupp has pointed out, the otherwise straight line of the pyramids is deformed towards the north, but the line of Orion's Belt is deformed towards the south. ... Bauval's choice of 10 500 BC (when Orion is furthest south in its precessional cycle) also reinforces his argument that the Milky Way aligned with the Nile. But the course of the Nile is variable, and we do not now know where it ran in 10 500 BC with any accuracy." 1995, Graham Hancock, 'Fingerprints of the Gods', pp. 343-344: "West's evidence focused on certain key structures, notably the Great Sphinx and the Valley Temple at Giza and, much farther south, the mysterious Osireion at Abydos. He argued that these desert monuments showed many scientifically unmistakable signs of having been weathered by water, an erosive agent they could only have been exposed to in sufficient quantities during the damp 'pluvial' period that accompanied the end of the last Ice Age around the eleventh millennium BC. 10 The implication of this peculiar and extremely distinctive pattern of 'precipitation induced' weathering, was that the Osireion, the Sphinx, and other associated structures were built before 10,000 BC. 11"
1995, Graham Hancock, 'Fingerprints of the Gods', pp. 438-439: "Around 10,450 BC, the sun on the vernal equinox rose in the constellation of Leo. On the ground at Giza, this event was frozen into architecture in the shape of the Sphinx, a gigantic, leonine, equinoctial marker which, like the second signature on an official document, could be taken as a confirmation of authenticity. The eleventh millennium BC, in other words, soon after the 'Mill of Heaven' broke, shifting sunrise on the spring equinox from Virgo into the constellation of Leo, was the only epoch in which the due east facing Sphinx would have manifested exactly the right symbolic alignment on exactly the right daywatching the vernal sun rising in the dawn sky against the background of his own celestial counterpart." June 1999, Vol. 40, Anthony Patrick Fairall (1943-2008; an experienced professor at the University of Cape Town and director of Cape Town Planetarium) for Astronomy & Geophysics, the journal of the Royal Astronomical Society (RAS) in England, 'Precession and the layout of the ancient Egyptian pyramids' (pdf file): "A parallel assertion of Hancock and Bauval is to say that 10 500 BC would be during the astrological "Age of the Lion" – a connection that they seek with the Sphinx. However, the vernal equinox of 10 500 BC would lie at 2000: 11 h 40 m, +2.2°, which, although close to the star pattern we now know as Leo, still lies decidedly in Virgo. Again, not a perfect match. ... The astronomical basis for arguing that the layout at Giza goes back to 10 500 BC is therefore very thin. Astronomy can do much to counter the publicity surrounding books that base so much conjecture upon such flimsy science. 1995, Graham Hancock, 'Fingerprints of the Gods', pp. 403-405: "Almost as an afterthought, [R.A. Schwaller de Lubicz] added: "A great civilization must have preceded the vast movements of water that passed over Egypt, which leads us to assume that the Sphinx already existed, sculptured in the rock of the west cliff at Giza that Sphinx whose leonine body, except for the head, shows indisputable signs of water erosion."
Professor Robert Schoch, a Boston University geologist and specialist in rock erosion who had played a key role in validating West's evidence, was satisfied as to the reason for this. The weathering of the Sphinx and of the walls of its surrounding rock-hewn enclosure had not been caused by wind-scouring at all but by thousands of years of heavy rainfall long ages before the Old Kingdom came into being." 1993, transcripts of the 6th International Congress on Egyptology,Volume II, Dr. Zahi Hawass, 'The Great Sphinx at Giza: Date and Function', pp. 178-179: "Important new evidence has been revealed during conservation work now in progress on the Sphinx. To reiterate, most of the current work on the Sphinx is to replace the large stones that were added to the lion's body during 1982-1987 with other stones, their sizes based on the photogrammetric map that was recorded in 1979 . This is a unique opportunity for scholars to look carefully at the 178 mother rock and to distinguish all the different levels of reconstruction and conservation that happened down through the ages. The most important fact is that the Sphinx's body is comprised mostly of poor quality layer beds of mother rock with many vertical fissures (Member II) . At the very base of the Sphinx there is a harder quality stone which is, however, very rough and brittle (Member I). Some of the larger fissures pass through Member II and right down into Member I which makes up the lowest part of the lion body and the floor of the Sphinx. ... At the very base of the Sphinx, where we have gained a good look at the mother rock, there are extremely large limestone blocks, similar to those from [the] Turah [quarry] in their quality, that cover the bedrock and form a casing or coating over the Sphinx. Since the hard Member I mother rock [the Sphinx's bottom layer] does not weather, its rough surface underneath these large blocks must have been left as we see it by the original Sphinx builders. It was also in this condition when the casing of the very large blocks just mentioned was added. The conclusion follows that these large blocks belong to an Old Kingdom casing that was done by Khafra's workmen in order to complete the modelling of the lion body, since the poor quality limestone of Member II, higher up and comprising most of the core body, would not suffice for fine modelling. The Sphinx architect tried to complete the mother rock sculpture by adding stones, exactly as the builders did with the pyramids, matabas, and temples of this time . We know that the weak Member II mother rock [the upper layers] was badly deteriorated when the Sphinx was restored in the 18th Dynasty, 1200 years after the carving of the Sphinx. We know from the Thutmose IV Granite Stela that the Sphinx was buried up to its neck in sand in around 1400 B.C. ... Only the head and neck were completed in the mother rock and left without covering because the layers from which they were carved are stronger (Member III). This is indicated clearly in the much better preser- vation of the surfaces of the Sphinx's face and head as compared with the major part of the lion body." 1995, Graham Hancock, 'Fingerprints of the Gods', p. 427: "The hypothesis proposes that this is what the enigmatic structures on the Giza plateau are all about: 1) that the Great Sphinx is indeed, as we have argued in previous chapters, an equinoctial marker for the Age of Leo, indicating a date in our own chronology of between 10,970 BC and 8810 BC; 2) that the three principal pyramids are indeed laid out in relation to the Nile Valley to mimic the precise dispositions of the three stars of Orion's Belt in relation to the course of the Milky Way in 10,450 BC." June 1999, Vol. 40, Anthony Patrick Fairall (1943-2008; an experienced professor at the University of Cape Town and director of Cape Town Planetarium) for Astronomy & Geophysics, the journal of the Royal Astronomical Society (RAS) in England, 'Precession and the layout of the ancient Egyptian pyramids' (pdf file): "Bauval's choice of 10 500 BC (when Orion is furthest south in its precessional cycle) also reinforces his argument that the Milky Way aligned with the Nile. But the course of the Nile is variable, and we do not now know where it ran in 10 500 BC with any accuracy." 1995, Graham Hancock, 'Fingerprints of the Gods', p. 399: "We've noted in earlier chapters that the Sahara, a relatively young desert, was green savannah until about the tenth millennium BC; this savannah, brightened by lakes, boiling with game, extended across much of upper Egypt. Farther north, the Delta area was marshy but dotted with many large and fertile islands. Overall the climate was significantly cooler, cloudier and rainier than it is today. 9 Indeed, for two or three thousand years before and about a thousand years after 10,500 BC it rained and rained and rained. Then, as though marking an ecological turning-point, the floods came. When they were over, increasingly arid conditions set in. 10 This period of desiccation lasted until approximately 7000 BC when the 'Neolithic Subpluvial' began with a thousand years of heavy rains, followed by 3000 years of moderate rainfall which once again proved ideal for agriculture: 'For a time the deserts bloomed and human societies colonized areas that have been unable to support such dense populations since.' 11 By the birth of dynastic Egypt around 3000 BC, however, the climate had turned around again and a new period of desiccation had begunone that has continued until the present day." Perimeter : original height = 2pi (6.28). 6.28 : 2 = 3.14 (pi). ralph-abraham.org/courses/math181/math181.S96/ lectures/lecture.5m/cheops/pi.html (personal site of a professor in mathematics and chaos theory): "In the middle of p. 254 Edwards mentions this trigonometric fact, apparently first noticed John Taylor around 1837 (see Tompkins, p. 70): "The normal angle of incline was about 52 degrees - a slope which, in the pyramid of Meidum and in the Great Pyramid, would have resulted if the height had been made to correspond with the radius of a circle the circumference of which was equal to the perimeter of the pyramid at ground level." *) Golden Ratio: 1.618. It is unknown if the number has any practical use, but it is popular as a number that represents harmony. *) Practical example: Side A is 100. Then side B must 61.8. Because: 100 : 61.8 = 1.618 while 61.8 : 38.2 (together 100) is also 1.618. Take any other number and the two results will always be different from each other. *) In case of the Great Pyramid: 186.4 m (original slope height): 115.2 m (half base) = 1.618 (ratio). *) en.wikipedia.org/wiki/Golden_ratio: "In 1859, the pyramidologist John Taylor claimed that, in the Great Pyramid of Giza, the golden ratio is represented by the ratio of the length of the face (the slope height), inclined at an angle θ to the ground, to half the length of the side of the square base, equivalent to the secant of the angle θ. The above two lengths were about 186.4 and 115.2 meters respectively. The ratio of these lengths is the golden ratio, accurate to more digits than either of the original measurements. Similarly, Howard Vyse, according to Matila Ghyka, reported the great pyramid height 148.2 m, and half-base 116.4 m, yielding 1.6189 for the ratio of slant height to half-base, again more accurate than the data variability." 2pi results in a 51.5° angle, which results in a golden ratio between slope length and half-base. *) Fibonacci sequence: 0, 1, 1, 2, 3, 5, 8, 13, 21, 34, 55, 89, 144, 233, 377, 610, 987, 1597, 2584, 4181, 6765, 10946, 17711, 28657, 46368, 75025, 121393, 196418, 317811, etc. How it works: Each time you add up the last two numbers. Each new number is the sum of the previous two. Example: 5 + 8 = 13. Then: 8 + 13 = 21. *) Fibonacci rectangle: You often see a rectangle divided in 2 parts. In that case the dividing line is located at 61.8 percent of one side and 38.2 perfect of the other. The smallest part is then again divided in the same matter. And again. And again, basically into infinity. *) Fibonacci spiral: You can draw a spiral going through all the similar points of the different rectangles. *) Golden ratio relationship with the Fibonacci sequence: Divide a number with the previous one and it will give 1.618. It actually starts out inaccurate, but becomes increasingly more accurate as the numbers increase. 2 : 1 = 2 (completely inaccurate). 8 : 5 = 1.6 (accuracy: 1/10). 21 : 13 = 1.6153 (accuracy: 1/100). 89 : 55 = 1.6182 (accuracy: 1/1000). 196418 : 121393 = 1.61803399 (accuracy: 1/10 million). *) The amazing thing is that we increasingly find Fibonacci sequences and golden ratios in nature. *) April 2008, Volume 70, Issue 3, Bulletin of Mathematical Biology, pp. 643-653, 'Nucleotide Frequencies in Human Genome and Fibonacci Numbers': "This work presents a mathematical model that establishes an interesting connection between nucleotide frequencies in human single-stranded DNA and the famous Fibonacci's numbers. The model relies on two assumptions. First, Chargaff's second parity rule should be valid, and second, the nucleotide frequencies should approach limit values when the number of bases is sufficiently large. Under these two hypotheses, it is possible to predict the human nucleotide frequencies with accuracy. This result may be used as evidence to the Fibonacci string model that was proposed to the sequence growth of DNA repetitive sequences. It is noteworthy that the predicted values are solutions of an optimization problem, which is commonplace in many of nature's phenomena." Perimeter : original height = not 2pi (6.28). So no 6.28 : 2 = 3.14 (pi). 1995, Graham Hancock, 'Fingerprints of the Gods', p. 418: "As near as makes no difference, therefore, the perimeter of the Great Pyramid's base is indeed 1:43,200 of the equatorial circumference of the earth. And as near as makes no difference, the height of the Great Pyramid above that base is indeed 1:43,200 of the polar radius of the earth. In other words, during all the centuries of darkness experienced by Western civilization when knowledge of our planet's dimensions was lost to us, all we ever needed to do to rediscover that knowledge was to measure the height and base perimeter of the Great Pyramid and multiply by 43,200! How likely is this to be an accident'? The commonsense answer is not very likely at all,' since it should be obvious to any reasonable person that what we are looking at could only be the result of a deliberate and carefully calculated planning decision." June 1999, Civil Engineering magazine, 'Program Management B.C. ': "We estimated that a delivery rate of 180 blocks per hour was required from level 50 to level 74 and then used this rate to determine if the ramp size and number of crews were feasible. This seemed possible. We then determined that at the lower level the ramp would be wider and could sustain delivery rates twice this number. Above level 75 the delivery rate drops off because of the smaller number of blocks, so ramp size and crew numbers are reduced. The size of crews can be estimated in various ways. Carrying capacity will ultimately depend on load and distance. We assumed an average crew of 20 men." Pdf of full article. 1995, Graham Hancock, 'Fingerprints of the Gods', pp. 320-323: "Of course, as [Flinders] Petrie admitted, no actual jewelled drills or saws had ever been found by Egyptologists. 12 The visible evidence of the kinds of drilling and sawing that had been done, however, compelled him to infer that such instruments must have existed. He became especially interested in this and extended his study to include not only the King's Chamber sarcophagus but many other granite artifacts and granite 'drill cores' which he collected at Giza. The deeper his research, however, the more puzzling the stone-cutting technology of the Ancient Egyptians became: "The amount of pressure, shown by the rapidity with which the drills and saws pierced through the hard stones, is very surprising; probably a load of at least a ton or two was placed on the 4-inch drills cutting in granite. On the granite core No 7 the spiral of the cut sinks 1 inch in the circumference of 6 inches, a rate of ploughing out which is astonishing ... These rapid spiral grooves cannot be ascribed to anything but the descent of the drill into the granite under enormous pressure ..." 13 Wasn't it peculiar that at the supposed dawn of human civilization, more than 4500 years ago, the Ancient Egyptians had acquired what sounded like industrial-age drills packing a ton or more of punch and capable of slicing through hard stones like hot knives through butter? Petrie could come up with no explanation for this conundrum. Nor was he able to explain the kind of instrument used to cut hieroglyphs into a number of diorite bowls with Fourth Dynasty inscriptions which he found at Giza: "The hieroglyphs are incised with a very free-cutting point; they are not scraped or ground out, but are ploughed through the diorite, with rough edges to the line ..." 14 This bothered the logical Petrie because he knew that diorite was one of the hardest stones on earth, far harder even than iron. 15 Yet here it was in Ancient Egypt being cut with incredible power and precision by some as yet unidentified graving tool: As the lines are only 1/150 inch wide it is evident that the cutting point must have been much harder than quartz; and tough enough not to splinter when so fine an edge was being employed, probably only 1/200 inch wide. Parallel lines are graved only 1/30 inch apart from centre to centre. 16 In other words, he was envisaging an instrument with a needle-sharp point of exceptional, unprecedented hardness capable of penetrating and furrowing diorite with ease, and capable also of withstanding the enormous pressures required throughout the operation. What sort of instrument was that? By what means would the pressure have been applied? How could sufficient accuracy have been maintained to scour parallel lines at intervals of just 1/30-inch? At least it was possible to conjure a mental picture of the circular drills with jewelled teeth which Petrie supposed must have been used to hollow out the lung's Chamber sarcophagus. I found, however, that it was not so easy to do the same for the unknown instrument capable of incising hieroglyphs into diorite at 2500 BC, at any rate not without assuming the existence of a far higher level of technology than Egyptologists were prepared to consider. Nor was it just a few hieroglyphs or a few diorite bowls. During my travels in Egypt I had examined many stone vesselsdating back in some cases to pre-dynastic timesthat had been mysteriously hollowed out of a range of materials such as diorite, basalt, quartz crystal and metamorphic schist. 17 For example, more than 30,000 such vessels had been found in the chambers beneath the Third Dynasty Step Pyramid of Zoser at Saqqara. 18 That meant that they were at least as old as Zoser himself (i.e. around 2650 BC 19 ). Theoretically, they could have been even older than that, because identical vessels had been found in pre-dynastic strata dated to 4000 BC and earlier, 20 and because the practice of handing down treasured heirlooms from generation to generation had been deeply ingrained in Egypt since time immemorial." *) November 2000, PBS, 'Cutting Granite with Sand' (slideshow with images): "Today, quarrymen cut and carve granite using saws with diamond-edged blades and steel chisels. But ancient Egyptian quarrymen and stonemasons didn't have these modern tools. How, then, did they quarry and cut such clean lines in their obelisks and other monumental statuary? In its trip to Egypt in March 1999, NOVA brought along ancient-tools expert Denys Stocks to help explore this mystery. ... One of the most famous stones left behind is the Unfinished Obelisk, more than twice the size of any known obelisk ever raised. Quarrymen apparently abandoned the obelisk when fractures appeared in its sides. However, the stone, still attached to bedrock, gives important clues to how the ancients quarried granite. Archeologist Mark Lehner, a key member of the NOVA expedition, crouches in a granite trench that abuts one side of the Unfinished Obelisk. Lehner holds a piece of dolerite similar to the kind that he and others believe Egyptian quarrymen used to pound out the trench around the edges of the obelisk. They then lifted the pulverized granite dust out of the trenches with baskets. Evidence also exists that workers pounded underneath the obelisk until the monument rested on a thin spine. Lehner says that huge levers were probably used to snap the obelisk from its spine, freeing it so it could be carved more finely and transported. Archeologists know that the ancient Egyptians had the skills to forge bronze and copper tools. Stonemason Roger Hopkins takes up a copper chisel, which works well when carving sandstone and limestone rock, to see if it might carve granite. "We're losing a lot of metal and very little stone is falling off," observes Hopkins, which is hardly the desired result. Hopkins' simple experiment makes this much clear: The Egyptians needed better tools than soft bronze and copper chisels to carve granite. As a young man, Denys Stocks was obsessed with the Egyptians. For the past 20 years, this ancient-tools specialist has been recreating tools the Egyptians might have used. He believes Egyptians were able to cut and carve granite by adding a dash of one of Egypt's most common materials: sand. "We're going to put sand inside the groove and we're going to put the saw on top of the sand," Stocks says. "Then we're going to let the sand do the cutting." It does. The weight of the copper saw rubs the sand crystals, which are as hard as granite, against the stone. A groove soon appears in the granite. It's clear that this technique works well and could have been used by the ancient Egyptians. Besides cutting clean surfaces on their granite, the Egyptians also drilled cylindrical holes into their stones. A hole eight inches in diameter was found drilled in a granite block at the Temple of Karnak. "Even with modern tools—stone chisels and diamond wheels—we would have a tough time doing such fine work in granite," says Hopkins. Stocks was brought along to test his theories about how the cores were drilled. Inspired by a bow drill seen in an ancient Egyptian wall painting, Stocks designs a home-made bow drill. He wraps rope around a copper pipe that the Egyptians could have forged. Hopkins and Lehner then pull back and forth on the bow, which is weighted from above. The pipe spins in place, rubbing the sand, which etches a circle into the stone. With the assistance of the sand, the turning copper pipe succeeds in cutting a hole into the granite slab. With the aid of a bow drill and sand, the pipe has cut a circular hole into the stone. But how can the drillers get the central core out? Stocks wedges two chisels into the circular groove. The core breaks off at its base. Stocks reaches in and plucks it out, leaving a hole behind not unlike the ones once cut by the Egyptians." Guindy Machine Tools Limited website, gmt.co.in/granite-surfaceplate.html, 'Granite for surface plates': "In general fine-grained Dolerite has better scratch resisting property than harder grey granites, this was conformed by scratch test using sharp diamond. ... Diabase / Dolerite is a variety of a stone type known as Gabbro. While it is closely related to granite, it is not the same. Dolerite lacks several of the minerals (such as quartz and mica) which give granite its distinctive grain structure. The lack of quartz means that Dolerite is slightly less resistant to wear than the hardest granite. However, this is offset by the lack of mica, which is very soft, and tends to flake out of granite plates, leaving pits. Dolerite is denser than granite, weighing about 190 lbs. per cu.ft. While most granite weigh between 160-170 lbs. per cu.ft. Dolerite is less porous and more stable, which means that a smoother and more uniform surface finish can be achieved. It can used for multi-dimensional, very high-accuracy applications that require a very smooth, stable surface like angle plates, parallels, master squares, straight edges and so on. Compressive strength of Dolerite ranges between 2000 – 3500 kg/cm2. Where as the strength of the Chinese granite and other relevant granite is between 2450 – 2540 kg/cm2. These analyses are to reveal that, even the top grade Chinese granite doesn't matches with the composition and percentage of advantage hold by the Dolerite. So, we come to conclusion that the Dolerite stays a way ahead of Chinese granite and other granite type in all the means." *) January-February 2000, Quest magazine, 'Rene Schwaller de Lubicz and the Intelligence of the Heart': "Along with Matisse and Bergson, Schwaller came under the influence of the new physics of Albert Einstein and Max Planck. Like many people today, Schwaller believed that the strange world of quantum physics and relativity opened the door to a universe more in line with the cosmologies of the ancients, and less compatible with the Newtonian clockwork world of the nineteenth century. ... In 1913–1914, Schwaller was active in French Theosophical groups and, one suspects, in occult circles in Paris in general. He read widely in Madame Blavatsky and other occult thinkers, and published a series of articles on the philosophy of science in Le Theosophe. ... Schwaller's political views were very different from Steiner's. Les Veilleurs ("The Watchmen" or "Vigilant Ones"), the political society Schwaller and Milosz began, espoused a decidedly conservative and elitist philosophy. Aside from a few exceptions, this seems common to many occult thinkers at that time, from W. B. Yeats to the more dubious individuals making up the notorious Thule Society. (Oddly enough, Rudolf Hess, a member of the Thule Society, was also one of "The Vigilant Ones.")... But according to André VandenBroeck, author of Al-Kemi: Hermetic, Occult, Political and Private Aspects of R. A. Schwaller de Lubicz (1987), these [public] sentiments [of Les Veilleurs] mixed with less democratic views--as well as a taste for dark shirts, riding pants, and boots—a questionable fashion statement in the years leading up to Hitler. A distaste for modern society and civilization runs throughout Schwaller's writings, a dissatisfaction with "mass man," a Nietzschean disdain of "the herd" that he shares with other esoteric thinkers like Julius Evola and René Guénon. ... Schwaller soon realized that politics are an unwieldy vehicle for truth and accepted that a literal theocracy wasn't feasible in his time. " *) January 2001, Number 9, Revue de l'Ordre Martiniste Traditionnel, pp. 35-36 (translated from French): "The members of the Theosophical Society were also interested in Synarchie, especially Lievin Revel and his son Gaston († 1939). The Revel family was convinced of the value of Synarchy. Like many, the upheaval of World War I led them to question the need to renovate society. To this end, Gaston Revel created l'Affranchi (1917-1919), a newspaper wanting to foster a new spirit in the spiritual, intellectual and moral social structures. ... Schwaller, who was also a Theosophist, and Milosz became involved in this effort, which took place in the wake of the Groupe Apostolique, the outer circle of the Tala des Frères d'Élie cult. This movement also consisted magazines like L'Art, la Revue Baltique, and Drapeau Bleu. In July 1919, l'Affranchi disappears to give rise to Le Veilleurs, a fraternal association for better life influenced by Fourniérism. Spurred on by Schwaller de Lubicz, this group will be very receptive to ideas of Saint-Yves d'Alveydre. ... Later, other members of the Theosophical Society are also interested in the Synarchie, particularly the Kurukshetra branch. This is the group that gave birth to the Synarchist Movement of Empire in 1937. The Kurukshetra was created around 1936 by Vivian Postel du Mas [wrote Le Pacte Synarchique, which caused a largely behind-the-scenes steer for advocating "a sort of super monopoly capitalism, with competition abolished and endless plans drawn up for production and distribution, the whole - as well as the government - to be run by knowledgeable technocrats. "], a strange character who loved mystery. Very marked by the East, he was a member of the Les Veilleurs Fraternity [of Schwaller and Rudolf Hess]." en.wikipedia.org/wiki/ Alexandre_Saint-Yves_d%27Alveydre: "[1842-1909]. ... During the year 1885 Saint-Yves was supposedly visited by a group of Eastern Initiates, one of them being named prince Hardjij Scharipf. It was then that he associated synarchy with "ascended masters" based in subterranean caverns of Agartha, who supposedly communicated with him telepathically. He wrote about this secret location in his "Mission de l'Inde en Europeä" published in 1886. Worried he had revealed too much he destroyed all but two copies of this book, which did not become available again until 1910. ... Saint-Yves believed that an ancient synarchist world government was transferred to Agartha within a hollow Earth at the start of the Kali-Yuga era, around 3,200 B.C. Saint-Yves d'Alveydre was the man who really introduced the concept of Agartha to the Western world. ... One of Saint-Yves's most influential theories nowadays was a minor feature of his work. This is his claim that the Great Sphinx was much older than Egyptologists thought, being created around 12,000 B.C. He believed the Sphinx was created by escapees from the destruction of Atlantis. He did not base this claim on any physical evidence. Saint-Yves' disciple René A. Schwaller de Lubicz was thus inspired to investigate the age of the Sphinx and as a result inspired an ongoing Great Sphinx controversy over the age of the monument." 1982 (original in French and from 1961), R. A. Schwaller de Lubicz, 'Sacred Science: The King of Pharaoic Theocracy', pp. 96-97: "A great civilization must have preceded the vast movements of water that passed over Egypt, which leads us to assume that the Sphinx already existed, sculptured in the rock of the west cliff at Giza, that Sphinx whose leonine body, except for the head, shows indisputable signs of aquatic erosion." July 2007, McK Mahille, J.; Schild, R.; Wendorf, F.; Brenmer, R., 'Astronomy of Nabta Playa' (adsabs.harvard.edu/abs/2007AfrSk..11....2M): "Dates for the quarrying and placement of these stones in the sediments of the playa are based on radiocarbon dates from the nearby quarry. Five radiocarbon dates from the quarry are 4500BC to 4200BC. ... The alignment, B2, may have been lined up with Alnilam, one of the three stars in the belt of Orion between approximately 4300-4100 BC, with winter solstice sunrise and later with Sirius, near the end of the Terminal Neolithic. The set of stele, B1, would have lined up with Sirius and A. Centauri which is the third brightest star in the night sky, in the period 4600-4300 BC. ... With the exception of Canopus, these alignments may have been associated with the brightest stars in the night sky of Nabta." September / October 1999, Skeptical Inquirer (CSICOP), 'Flash! Fox News Reports that Aliens May Have Built the Pyramids of Egypt! ': "So who are these purveyors of the strange? First, the views of Edgar Cayce, the deceased psychic mentioned in the Web site, are espoused by John Van Auken of the Edgar Cayce Foundation. He tells us we will be enlightened by the discovery of the secret hall of records containing the truth about our past. Then there is Richard Hoagland, author of The Monuments of Mars. We are descended, he says, from Martian refugees who settled at Gizeh. Robert Bauval is there, author of The Orion Mystery. The three pyramids of Gizeh were built thousands of years earlier than we think, according to him, since they must have been aligned with the Orion constellation, which was only possible in 10,500 b.c. We get to hear from John Anthony West, author of Serpent in the Sky. The Sphinx, he insists, must have been built in 12,000 b.c. in order for so much erosion to have occurred (and, of course, the fact that the head was refashioned is to him further proof of its fantastic antiquity). Graham Hancock, author of Heaven's Mirror, makes an appearance. He believes, among other things, that "an earlier civilization" that emphasized the soul rather than technology was destroyed in a great flood, and the survivors settled in Egypt. He says we are "technologically brilliant" but "spiritually barren" and so we should look to this ancient civilization for guidance. We are shown a wall inscription, which Hoagland says has pictures of "high-tech things" like "helicopters and land speeders and spaceships and the Millennium Falcon." To prove his point, the Fox production team overlays video of an Apache helicopter to show the similarity. According to Ms. Griffis-Greenberg, an Egyptologist at the University of Alabama at Birmingham, who saw this broadcast, this interpretation is absurd, but not new to her - it has cropped up on the Usenet so many times she is tired of answering it. But she was glad to explain yet again, and referred me to more credible sources. I spoke to several other Egyptologists who were amazed that this was being done on television, although one said to me that he expects this sort of thing now, "It is just what TV does." But what do the experts say about this "helicopter" glyph? This will serve as an example for all the rest: the "helicopter" is in fact the Abydos palimpsest. A palimpsest is what is created when new writing is inscribed over old. In the case of papyri, old ink is scraped off, but in the case of inscriptions, plaster is added over the old inscription and a new inscription is made. The image described as a helicopter is well known to be the names of Rameses inscribed over the names of his father (something Rameses was known to do quite frequently). A little bit of damage from time and weathering has furthered the illusion of a "helicopter. "6 What we should ask is why no Egyptologists were questioned about this, something well known in the literature? As one of them said to me, "We don't live under rocks!" It would not have been hard to get an expert to clarify the meaning of the "helicopter"-they had several experts on camera already. Hawass is heard saying the claim of aliens coming from space and building the pyramids "is nuts," but he is never asked to comment on any specific details of the arguments being made. This is a very one-sided investigation. The people are not being fairly informed." Ibid. : "We are shown a wall inscription, which Hoagland says has pictures of "high-tech things" like "helicopters and land speeders and spaceships and the Millennium Falcon." To prove his point, the Fox production team overlays video of an Apache helicopter to show the similarity. According to Ms. Griffis-Greenberg, an Egyptologist at the University of Alabama at Birmingham, who saw this broadcast, this interpretation is absurd, but not new to her - it has cropped up on the Usenet so many times she is tired of answering it. But she was glad to explain yet again, and referred me to more credible sources. I spoke to several other Egyptologists who were amazed that this was being done on television, although one said to me that he expects this sort of thing now, "It is just what TV does." But what do the experts say about this "helicopter" glyph? 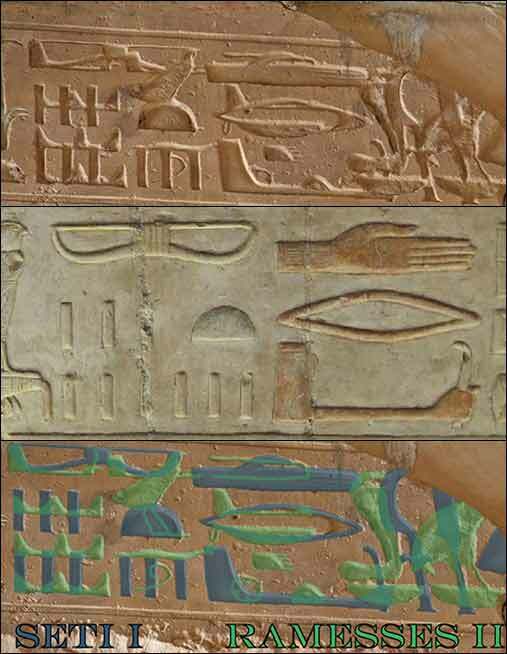 This will serve as an example for all the rest: the "helicopter" is in fact the Abydos palimpsest. A palimpsest is what is created when new writing is inscribed over old. In the case of papyri, old ink is scraped off, but in the case of inscriptions, plaster is added over the old inscription and a new inscription is made. The image described as a helicopter is well known to be the names of Rameses inscribed over the names of his father (something Rameses was known to do quite frequently). A little bit of damage from time and weathering has furthered the illusion of a "helicopter. "6 What we should ask is why no Egyptologists were questioned about this, something well known in the literature? As one of them said to me, "We don't live under rocks!" It would not have been hard to get an expert to clarify the meaning of the "helicopter"-they had several experts on camera already. Hawass is heard saying the claim of aliens coming from space and building the pyramids "is nuts," but he is never asked to comment on any specific details of the arguments being made. This is a very one-sided investigation. The people are not being fairly informed." en.wikipedia.org/wiki/ List_of_largest_monoliths_in_the_world is a beginning. September 11, 2012, Youtube upload, 'Strongman Truck Pull by Brian Shaw Pulling an 80,000 LB Fire Engine With Harness': "Mike Burke and I brushed off the truck pulling harness and stared at a fire engine that was weighed at 80,000 lbs fully loaded with water. Truck pull was done with the start being slightly uphill over a 25 meter course from a dead stop. Very challenging training pull with this truck pulling harness getting a real test. A truck pull is a pretty common strongman competition event. The World's Strongest Man truck pull in 2012 was a bus that weighed about 50-60,000 pounds." May 25, 2010 upload by David Wilcock, Youtube, 'David Wilcock Interviews Graham Hancock: Setting History Free!'. 1988, David Hatcher Childress, 'Lost Cities of Ancient Lemuria and the Pacific', pp. 72-73 (his translation of the Mahabharata texts). Mahabharata, book 8: Karna Parva, Section 34: "Then He called Nila Rohita (Blue and Red or smoke)--that terrible deity robed in skins, looking like 10,000 Suns, and shrouded by the fire of superabundant Energy, blazed up with splendour. ... The triple city then appeared immediately before that god of unbearable energy [Maheswara, or Siva], that Deity of fierce and indescribable form, that warrior who was desirous of slaying the Asuras. The illustrious deity, that Lord of the universe, then drawing that celestial bow, sped that shaft which represented the might of the whole universe, at the triple city. Upon that foremost of shafts, O thou of great good fortune, being shot, loud wails of woe were heard from those cities as they began to fall down towards the Earth. Burning those Asuras, he threw them down into the Western ocean." Mahabharata, book 8: Karna Parva, Section 33: "Day by day strong winds blew, and many were the evil omens that arose, awful and foreboding the destruction of the Vrishnis and the Andhakas. The streets swarmed with rats and mice. Earthen pots showed cracks or broken from no apparent cause. At night, the rats and mice ate away the hair and nails of slumbering men. […] That chastiser of foes commanded the Vrishnis to make a pilgrimage to some sacred water. The messengers forthwith proclaimed at the command of Kecava that the Vrishnis should make a journey to the sea-coast for bathing in the sacred waters of the ocean. (Mausala Parva, sec. 2)"
Mahabharata, book 16: Mausala Parva, section 1: "When the next day came, Camva actually brought forth an iron bolt through which all the individuals in the race of the Vrishnis and the Andhakas became consumed into ashes. Indeed, for the destruction of the Vrishnis and the Andhakas, Camva brought forth, through that curse, a fierce iron bolt that looked like a gigantic messenger of death. The fact was duly reported to the king. In great distress of mind, the king (Ugrasena) caused that iron bolt to be reduced into fine powder." January 2005, Philip Coppens, 'Best evidence': "Towns such as Harappa and Mohenjo Daro flourished in 3000 BC. The question is why these cities were abandoned. And one answer that has been put forward is that the ancient cities might have been irradiated by an atomic blast. If true, it would be impossible to ignore the conclusion that ancient civilisation possessed high technology. The story begins when a layer of radioactive ash was found in Rajasthan, India. It covered a three-square mile area, ten miles west of Jodhpur. The research occurred after a very high rate of birth defects and cancer was discovered in the area. The levels of radiation registered so high on investigators' gauges that the Indian government cordoned off the region. Scientists then apparently unearthed an ancient city where they found evidence of an atomic blast dating back thousands of years: from 8,000 to 12,000 years. The blast was said to have destroyed most of the buildings and probably a half-million people. Archeologist Francis Taylor stated that etchings in some nearby temples he translated suggested that they prayed to be spared from the great light that was coming to lay ruin to the city. ... When excavations of Harappa and Mohenjo-Daro reached the street level, they discovered skeletons scattered about the cities, many holding hands and sprawling in the streets as if some instant, horrible doom had taken place. People were just lying, unburied, in the streets of the city. And these skeletons are thousands of years old, even by traditional archaeological standards. What could cause such a thing? Why did the bodies not decay or get eaten by wild animals? Furthermore, there is no apparent cause of a physically violent death. A. Gorbovsky, in Riddles of Ancient History, reported the discovery of at least one human skeleton in this area with a level of radioactivity approximately 50 times greater than it should have been due to natural radiation. Furthermore, thousands of fused lumps, christened "black stones", have been found at Mohenjo-Daro. These appear to be fragments of clay vessels that melted together in extreme heat. ... With the apparent discovery of this radiated area, parallels were quick drawn to the Mahabharata, the Indian epic. It reads: "... (it was) a single projectile Charged with all the power of the Universe. [Etc., the regular forgery]""
Aug 12, 2002, The Hindu newspaper, ''Pokhran radiation level normal'': "The radiation level in Pokhran and in the villages surrounding the nuclear test site of May 1998 is normal, according to the Department of Atomic Energy (DAE). DAE, which collected samples of sand, milk, vegetables and grass from the area following rumours that cattle are dying in Khetolai, the nearest human habitation to the Pokhran blast site, has refuted the charges of radiation causing deaths of cattle. ''The cows could be dying due to lack of treatment facilities in the local veterinary hospital,'' observed S.K. Malhotra, head of the Public Awareness Division in DAE. ... Dr. Malhotra, who has been on an awareness building exercise in Jodhpur and the Rajasthan capital after the recent reports in the media on the possible adverse impact of the nuclear blasts in the Pokhran neighbourhood, said the explosion had been carried out deep inside the ground and that ever since there had been no radiation. "The radiation count is absolutely normal there.''" May 1964, Expedition magazine, Dr. George F. Dales, assistant curator of the Museum's new section of South Asia Archeology, 'The Mythical Massacre at Mohenjo-Daro'. Articles describes in depth the skeletons found in Mohenjo-Daro and Harappa: "Nine years of extensive excavations at Mohenjo-daro (1922-31)– a city about three miles in circuit–yielded the total of some 37 skeletons, or parts thereof, that can be attributed with some certainty to the period of the Indus civilization. Some of these were found in contorted positions and groupings that suggest anything but orderly burials. Many are either disarticulated or incomplete. They were all found in the area of the Lower Town–probably the residential district. Not a single body was found within the area of the fortified citadel where one could reasonably expect the final defense of this thriving capital city to have been made. It would be foolish to assert that the scattered skeletal remains represent an orderly state of affairs. But since there is no conclusive proof that they all even belong to the same period of time, they cannot justifiably be used as proof of a single tragedy. Part of this uncertainty results from the unsatisfactory methods used by the excavators to record and publish their finds. ... One reads about "the slaughtered Harappans" who "lay unburied amid their streets." This melodramatic description was prompted, in part, by the reported find of six skeletons in a lane between two houses in the VS area of Mohnejo-daro. And yet, the excavator stated in his report that "from their position they appear to be posterior to the adjacent remains." They were covered with loose earth, free from bricks and other debris that would indicate any violent destruction. There is no suggestion in the report that they were lying on the actual street surface."